November has come to an end and so kicks off Your Humble Author’s favorite time of the year. In fact we started early as just last week we had TWO editions of the SATURDAY SIX, a special Thanksgiving edition going over What Theme Park Fans Have To Be Thankful For in 2016, and the fan favorite 3rd Annual Theme Park Turkeys Of The Year. While it seemed to fly by, we actually had a bunch of interesting things happen last month. For those wondering just how many dessert parties Disney could make in one year, the correct answer was “infinity” and we just got our latest with the debut of Tiana’s Riverboat Party. Unlike traditional dessert parties offering “preferred viewing” of parades and fireworks, the view of the Festival of Fantasy parade from onboard the Liberty Belle reminded me of Bob Uecker’s “front row” seat. What started as a next level bananas rumor from the Grand Poohbah of TouringPlans, Len Testa, came to fruition just days later with the Kingdom Cabanas in Tomorrowland. 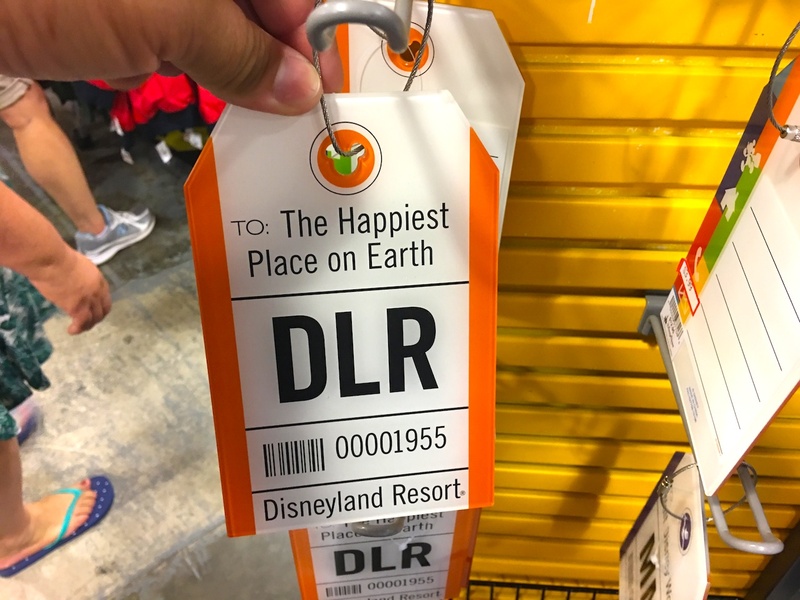 This is one of those things you can’t tell your non-theme park friends or coworkers because upon hearing the details they may try to get you committed to a mental institution. Great news for those of us who felt EPCOT’s International Food & Wine Festival was just too short, as next year’s edition will run for a new record of 75 days. But wait, there’s even more festival dates coming as 2017 brings us the brand new EPCOT International Festival of the Arts! 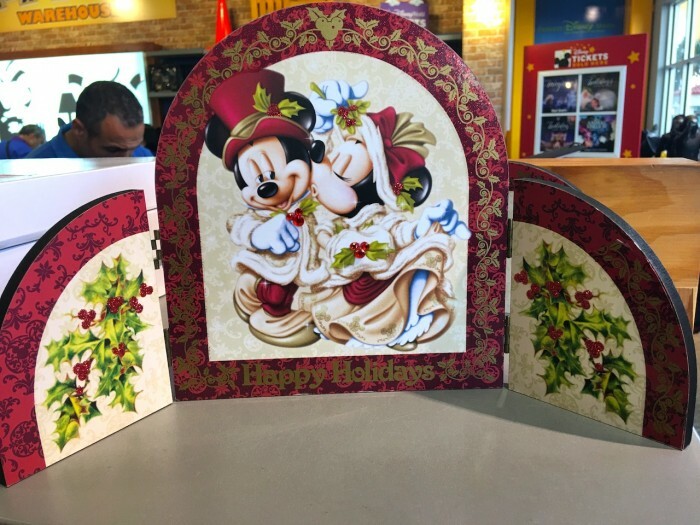 That’s right, from January 13th through February 20th guests will see Disney attempt to “combine visual, culinary and performing arts from around the world.” Whatever that means. I wish someone would take my idea of a festival built around the foods you can get a state fairs. I’m talking the most unhealthy foods in the entire world: fried candy bars, beer battered pretzel coated cheese curds, and bacon wrapped bacon. 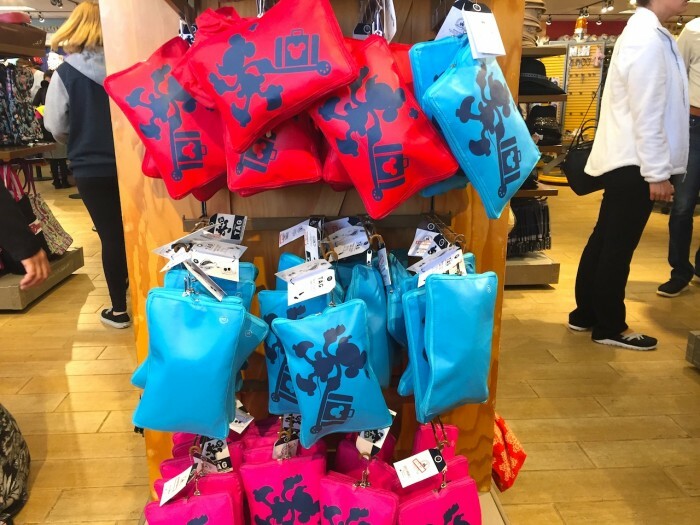 Now, while all of you were trying to open up a lemonade stand in the EPCOT parking lot, Outlet Intern Julia Mascardo and I were hard at work to bring you the quality Outlet coverage you expect deserve! First up is, as always, my unhealthy addiction to Tsum Tsums. 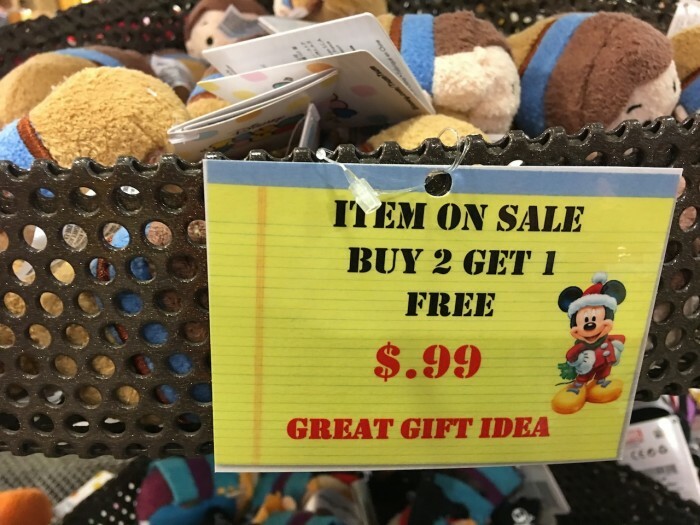 Tsums were STILL just $0.99 (for the third month in a row) and now they were BUY 2 GET 1! Unfortunately I had pretty much all the ones they were offering, but there were a couple new ones to the Outlet. 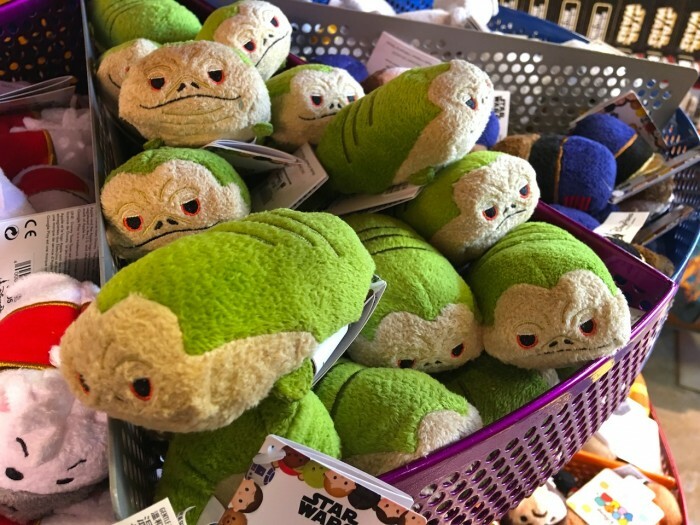 Buy 2 Get 1 Tsums! 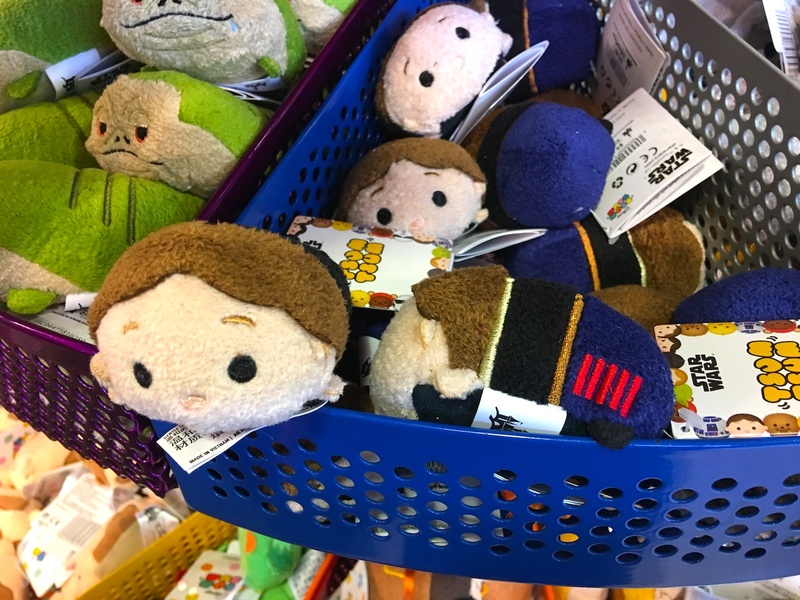 Both came from the Star Wars line of Tsum Tsums, including this Han Solo. And here is Jabba Desilijic Tiure, more commonly known as Jabba the Hutt. The next item was a shocker for me. 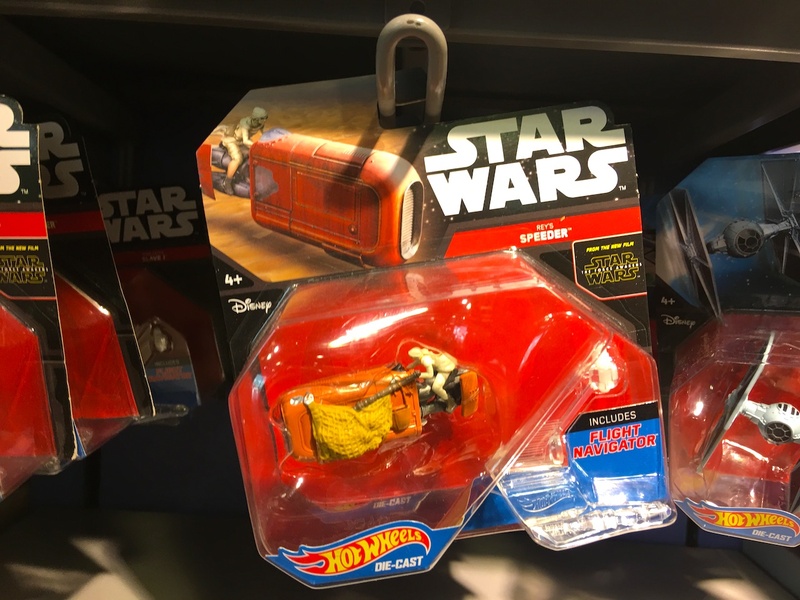 This Hippabore toy was the absolute FIRST item of Star Wars: The Force Awakens merchandise to make an appearance at Walt Disney World last year. Who knows why anyone in the world would buy one, even the die-hard Force Awakens fans, but here we are almost a year and a half later and they are just now hitting the Outlets. Originally $27.99, now $14.99. This was the creature Finn drank water next to in the trough. 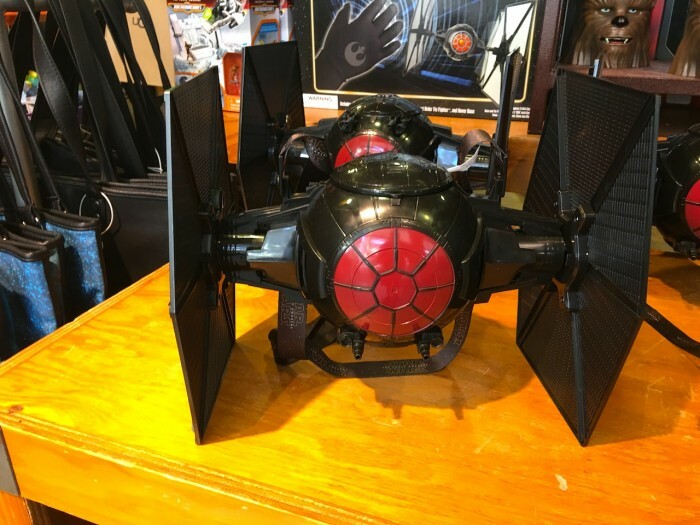 Next up was one I did get, the Tie-Fighter Popcorn Bucket. The wings of this thing fall off if you just look at it hard enough, and it holds approximately 32 pieces of popcorn, but like I’m not not going to buy this. Reduced to $7.99. Next one was a tougher internal choice. 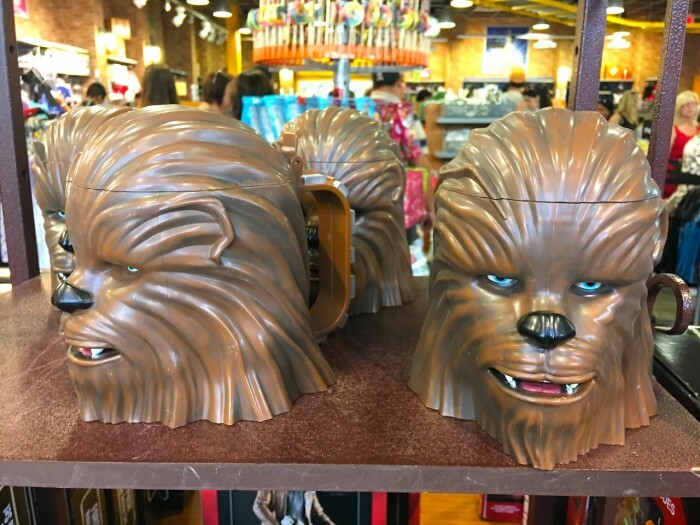 The Chewbacca souvenir steins arrived. 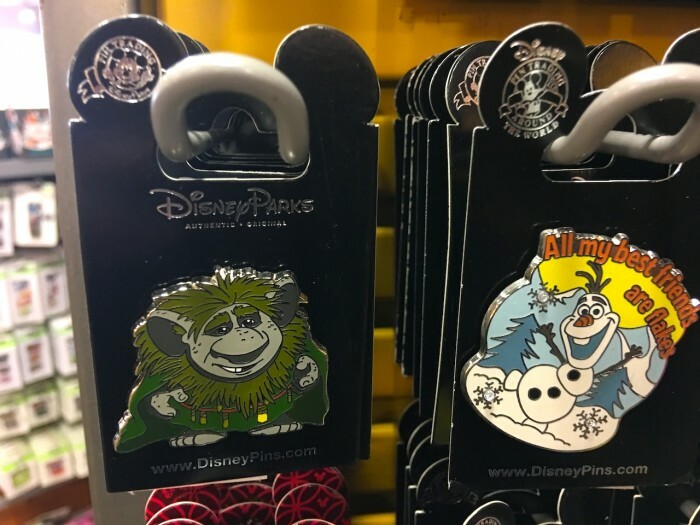 When these arrived at the parks I thought they were one of the weirdest things ever. It’s like you are drinking Chewie’s brain, and because of its size it is one of the most impractical cups ever made. I would imagine half the people who bought this had soda on their shirt after the first sip. However, it was only $5.99. What to do…. WDW1974, an icon on the WDWMagic.com forums, is also the arch-enemy of superblogger Tom Corless. So what would I do in this case? Here I am faced with a souvenir cup that basically can’t be used to drink out of. Like I even thought about that for two seconds. 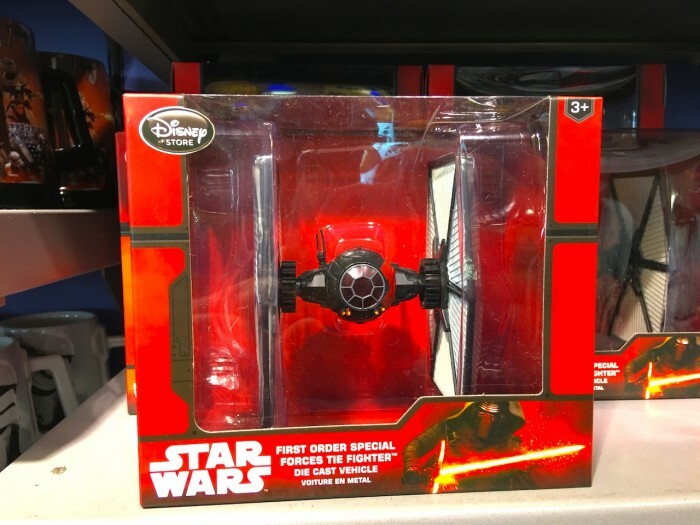 Next up was this Die Cast tie fighter. Originally $11.95, now $3.99. More die cast stuff with this one featuring Rey’s Speeder. Talk about an item begging to be a USB drive. 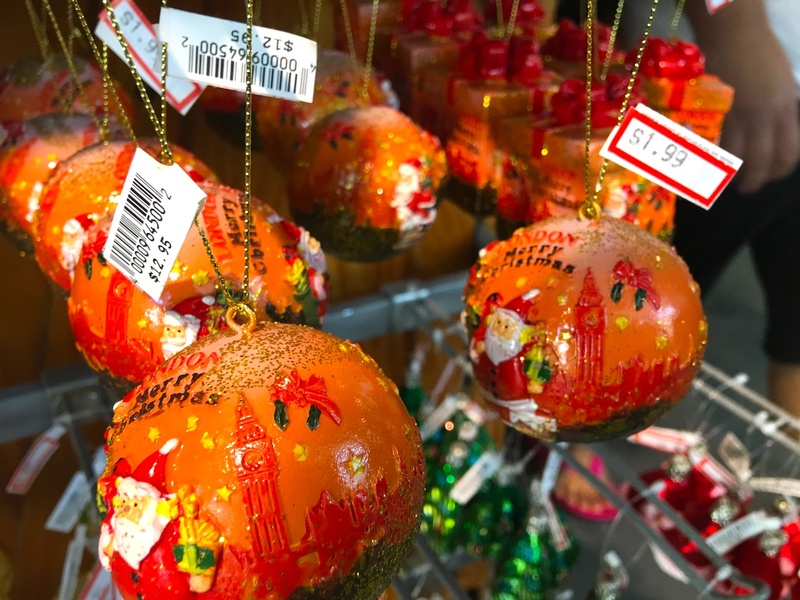 Originally $7.95, now $4.99. This die cast Command Shuttle was also originally $7.95, now $4.99. 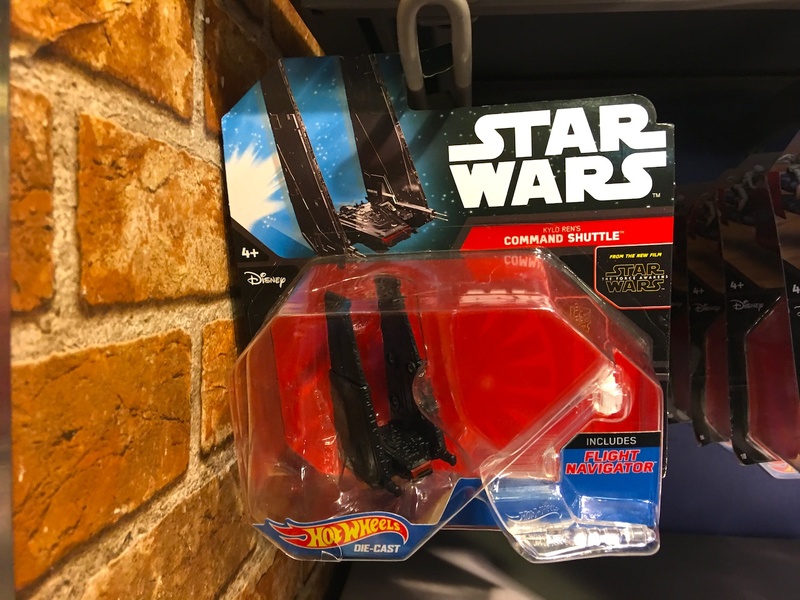 I’m no engineer, but I think any spaceship with wings that folded up like that would probably be at the Tatooine Pep Boys for a lot of repairs. Love Cars. Love Star Wars. Do not love these mashups. 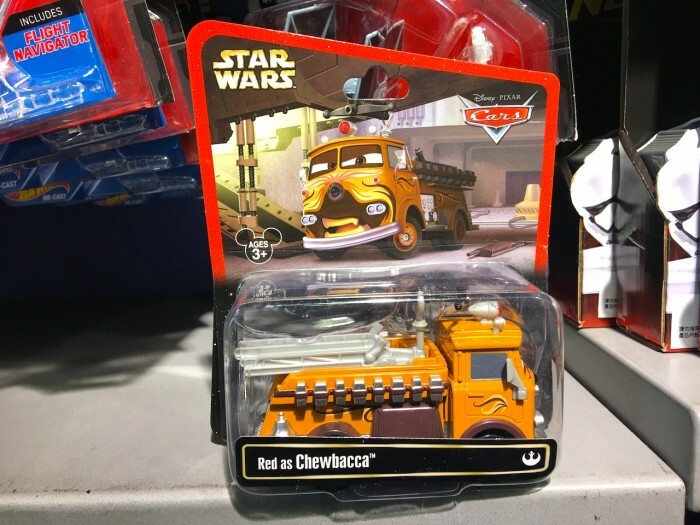 Here’s Red as Chewie which makes absolutely no sense. Who would Han be in this universe? 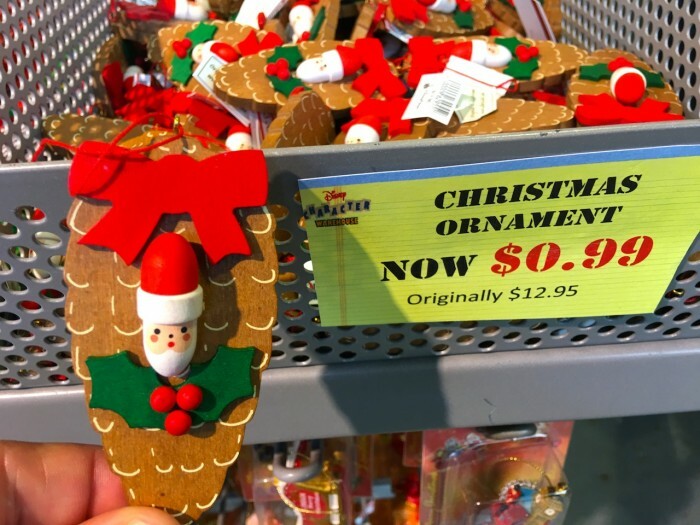 Originally $9.99, now $4.99. 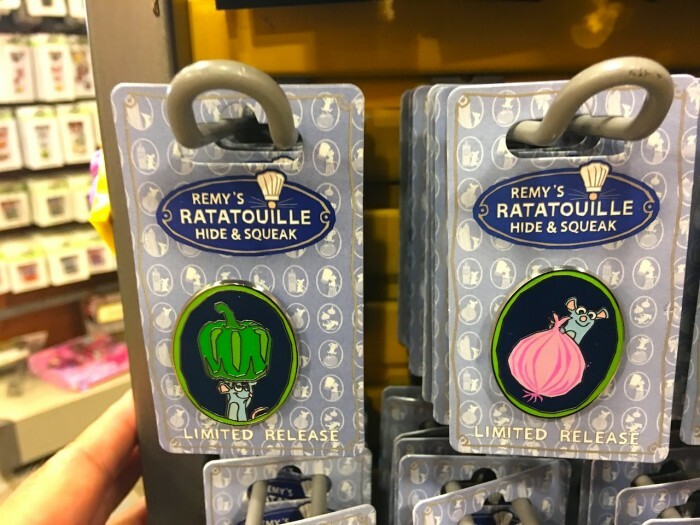 Remember last month with those bonkers Deal or No Deal suitcase pins? This month actually had some main event talent including Han Solo and General Ackbar. 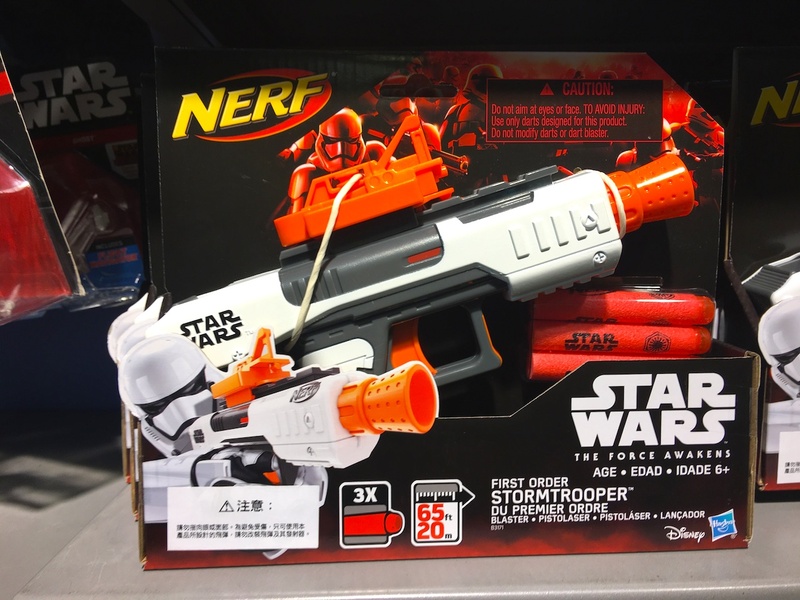 I didn’t see any discount on this Stormtrooper nerf gun, but I imagine its $14.99 price was about $9.99 if I took it to the register. Would have killed for something like this as a kid growing up. 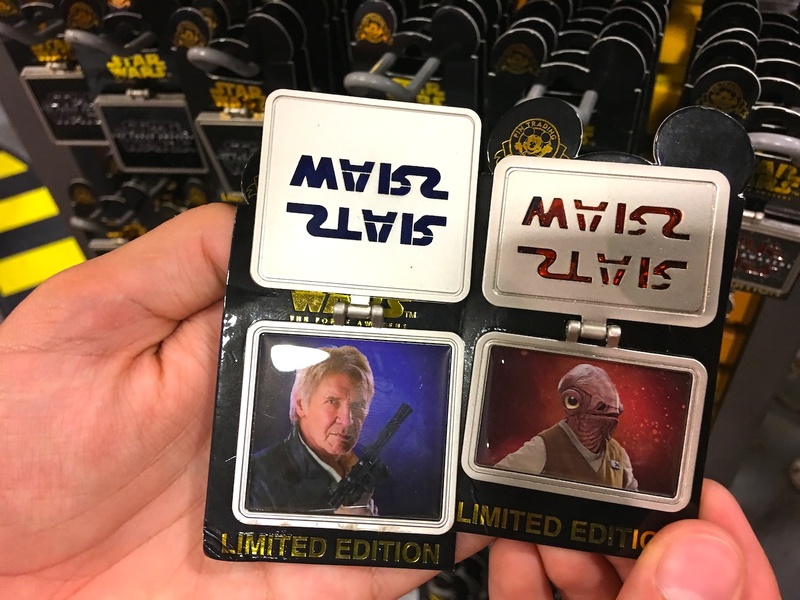 Interesting set of Disney/Star Wars mashup playing cards. Originally $12.99, now $4.99. 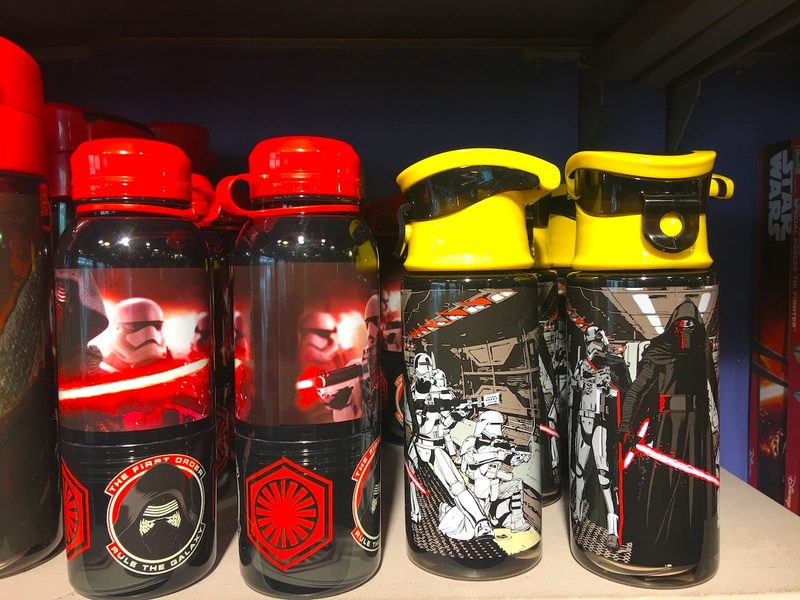 Some pretty cool bottles, especially the ones featuring the hand drawn art. I drink straight out of the 2 Liter bottle of Coke Zero so no need for these. Originally $8.99, now $2.99. 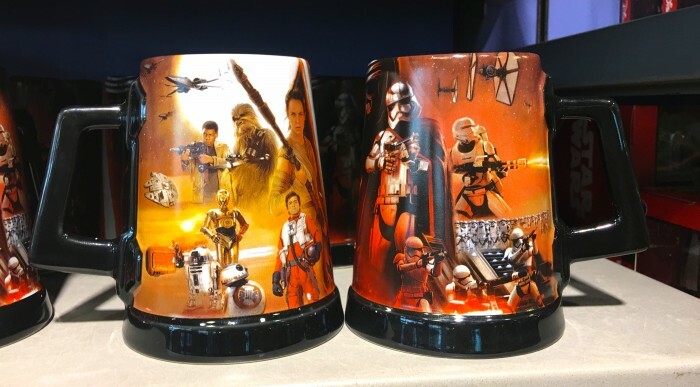 Force Awakens coffee cup. Originally $14.95, now $5.99. Believe it or not I have never had a cup of coffee in my entire life, but if I did drink it, I think I would have gotten this cute Finding Dory mug. Originally $19.99, now $7.99. 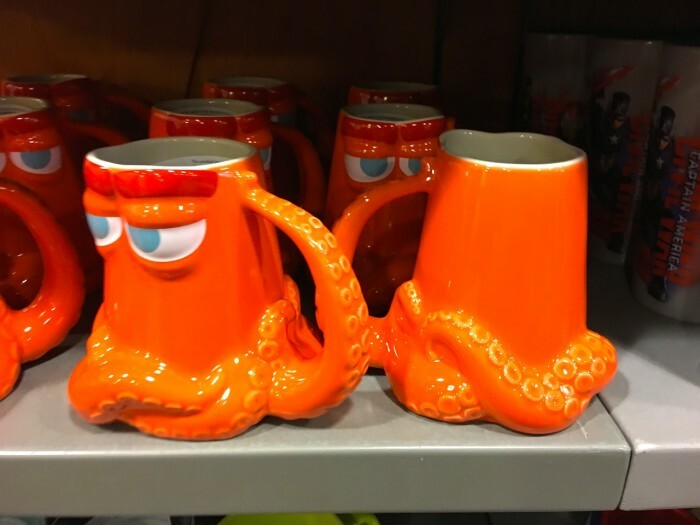 Not so much this Hank mug. Originally $14.99, now $5.99. Loved Hank in Finding Dory. 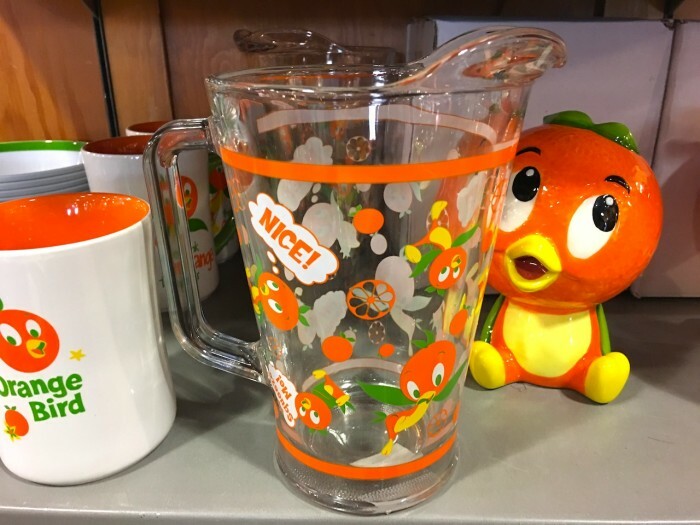 Love me some Little Orange Bird merchandise. These coffee cups were originally $14.95, now $5.99. This Orange Bird bowl was originally $6.99, now $2.99. 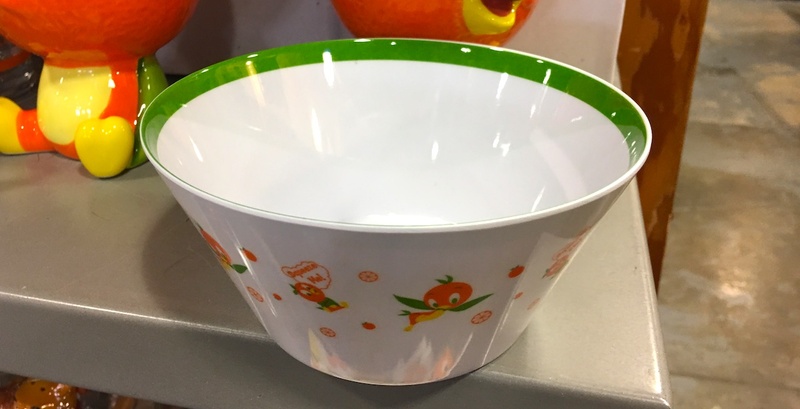 Another view of the Orange Bird bowl. Here are some Be Our Guest glasses that were originally $13.95, now $4.99. Now I love Beauty & The Beast as much as anyone and Be Our Guest Restaurant more than most, but this style does not interest me at all. 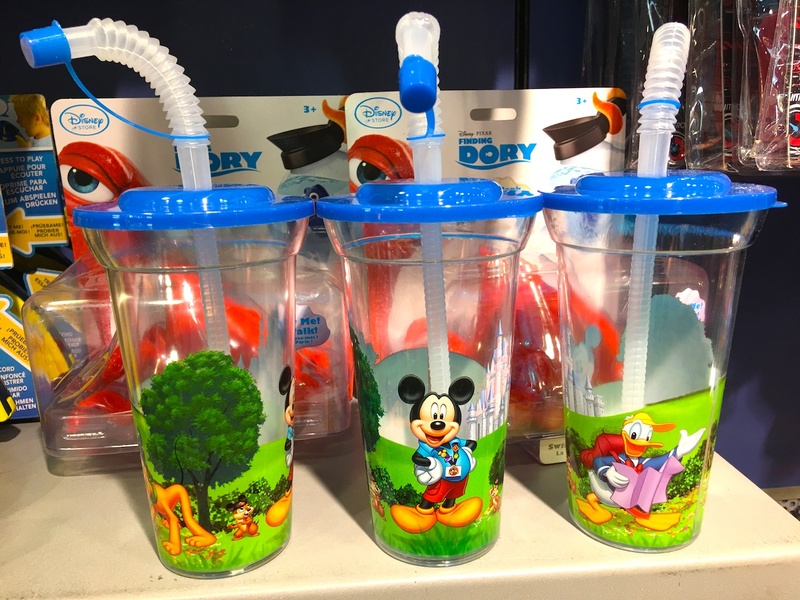 Children’s Disney cups. Originally $9.96, now $6.99. 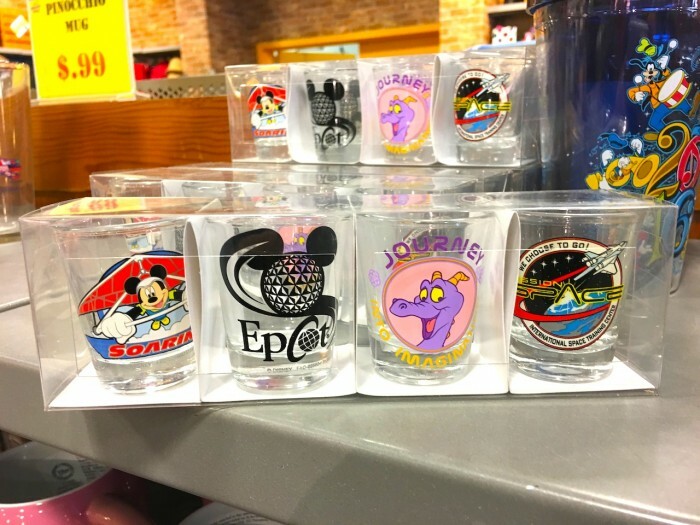 EPCOT shot glasses toothpick holders! You better believe I got these. Originally $27.99, now $9.99. 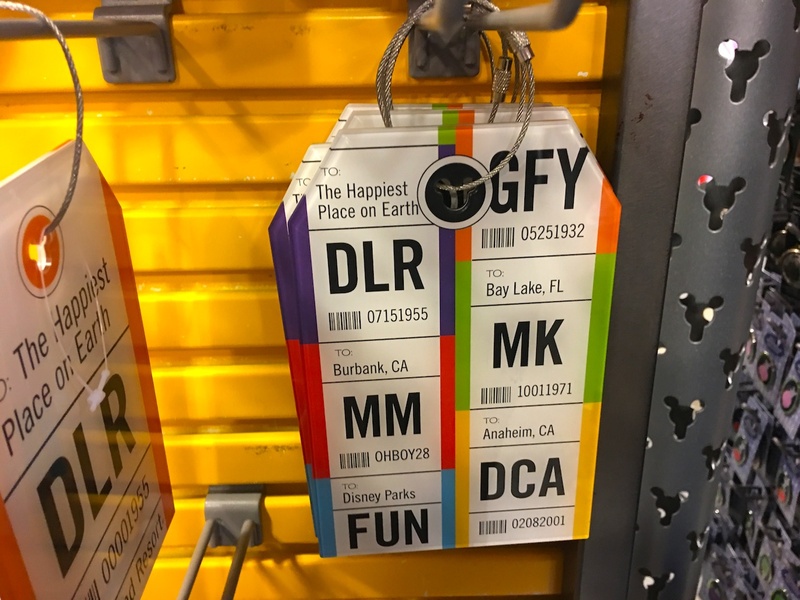 Would have preferred Nemo, Test Track or even Captain EO over Mission: SPACE but I’ll still take it. 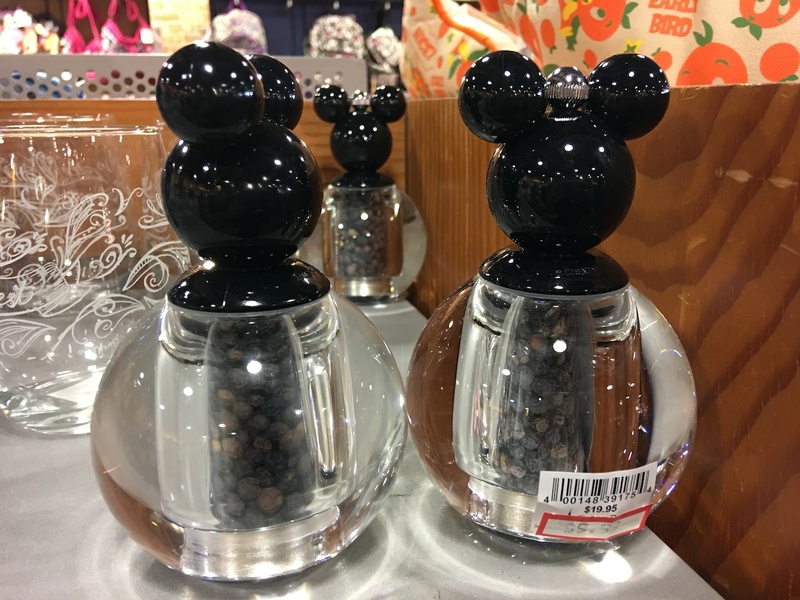 A Mickey pepper mill. Got it. Originally $19.95, now $9.99. Lots of Christmas stuff arrived at the Outlets, including this new window design in the front window. As seen at International Drive location. 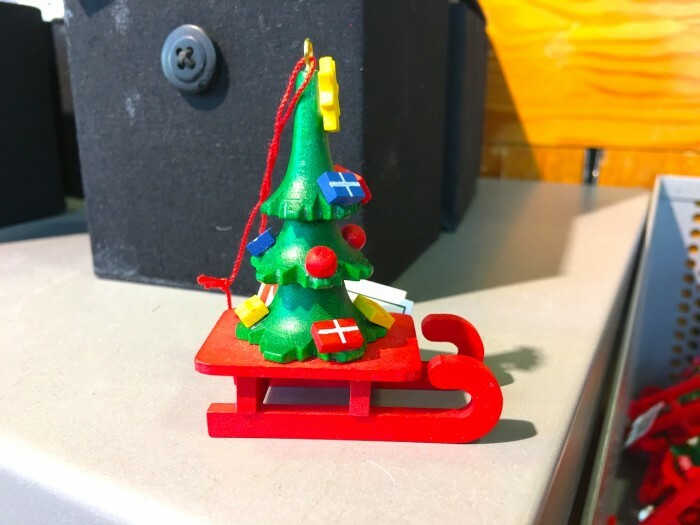 Now some of these ornaments you are about to see are CRAZY and we’ll start off with this one featuring Santa Claus on a pine cone. Whaaaaaaaaaaaaaaaaat?! Even crazier, this was originally $12.95?!!!!!!!!!!!! 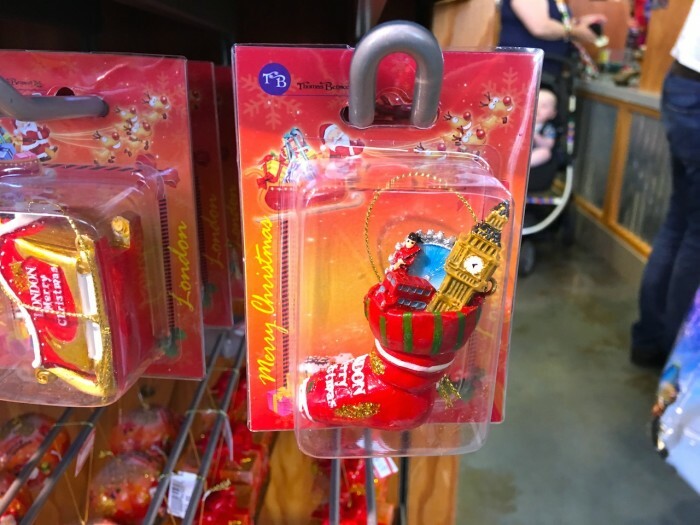 Check this out, a London stocking with Big Ben, a double decker bus, and a London Guard stuffed in. Originally $10.95, now $1.99. By this point in the photo tour I had to stop and take another, much larger, dose of Xanax. Here’s Santa delivering gifts to all the good girls and boys of London. Originally $12.95, now $1.99. I think if I squint closely enough I can see UUOP’s own Lee Mallaby and his lovely wife Tracey in one of those buildings. Sometimes I can’t believe my own eyes. Originally $14.95, now $3.99. 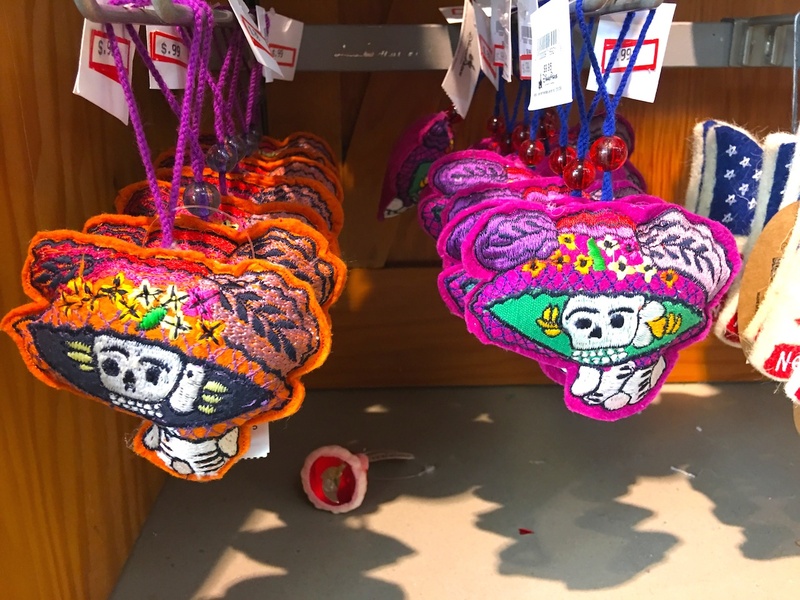 For those who needed a Christmas ornament featuring a dead chihuahua, these ones are perfect. Originally $9.95, now 99 cents. As if the Magic Kingdom cabanas weren’t proof enough, it seems that some people just have way too much money to spend. These ornaments were originally $12.95. That’s right, almost $13 for what I’m assuming is a shopping list for gingerbread men. Now they are 99 cents. The picture below is both sides of the ornament. IT DOESN’T MAKE ANY SENSE!!!!! Maybe I need to look into putting up one of those Halloween trees instead. Not exactly 100% sure what this is other than maybe something to decorate your house. Because it’s mistletoe based maybe you are supposed to hang it over a doorway? Originally $29.95, now $12.99. There are days where I feel like I’m in an episode of the Twilight Zone where I wake up and everyone is living in a completely different world than the one I grew up in. 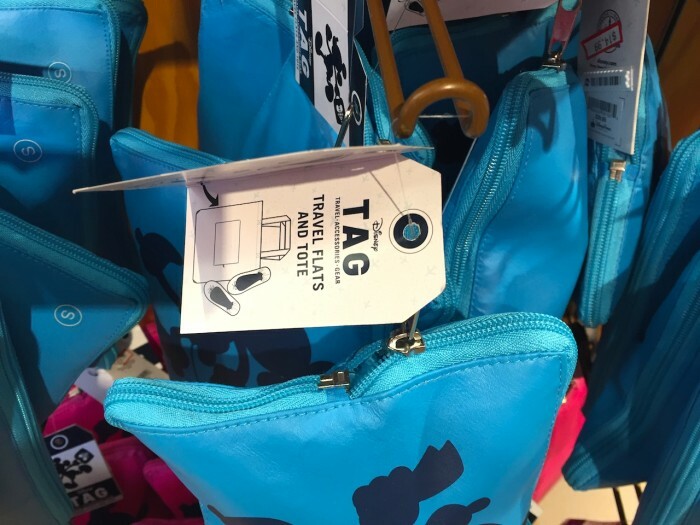 This item is a Disney branded “Travel Flats and Tote.” I don’t even know what a travel flat is. I’ve lived in three places in my life, San Diego, New Hampshire, and Florida. I’m no stranger to flying. I know a lot of people who fly. How have I never even heard of this?! 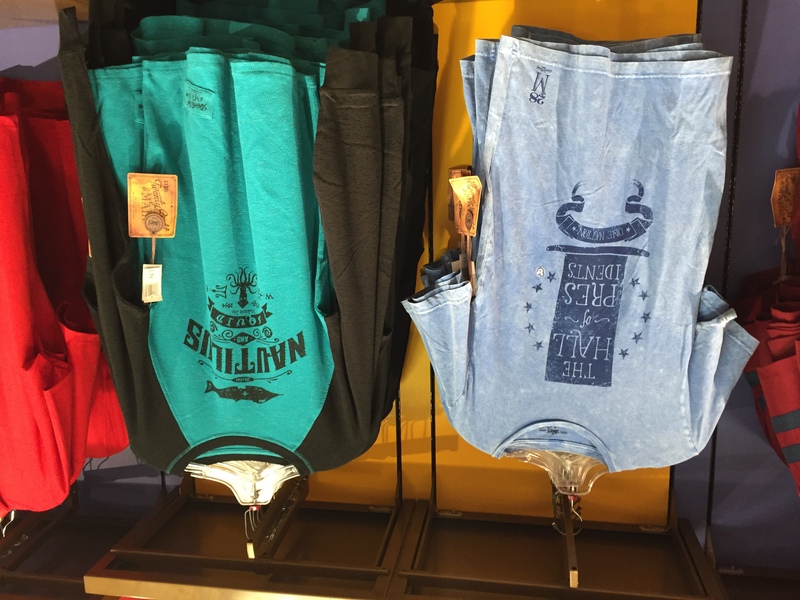 Originally $39.95, now $14.99. Up next is a giant luggage tag featuring Pluto. Originally $12.95, now $3.99. We need a Disney short where Donald Duck tries to bring Pluto onto a plane as a therapy dog. More luggage tags, this one featuring the Disneyland Resort. Originally $12.95, now $3.99. This one is kinda weird. 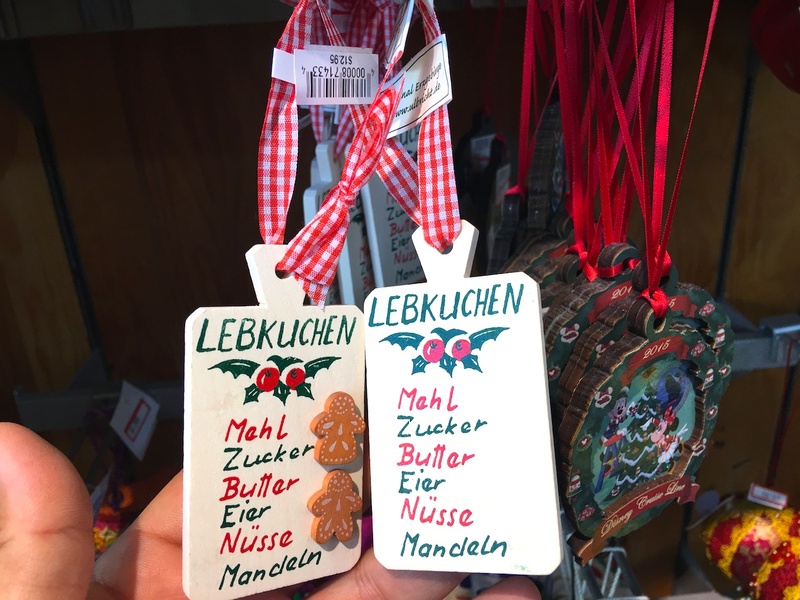 Same price. 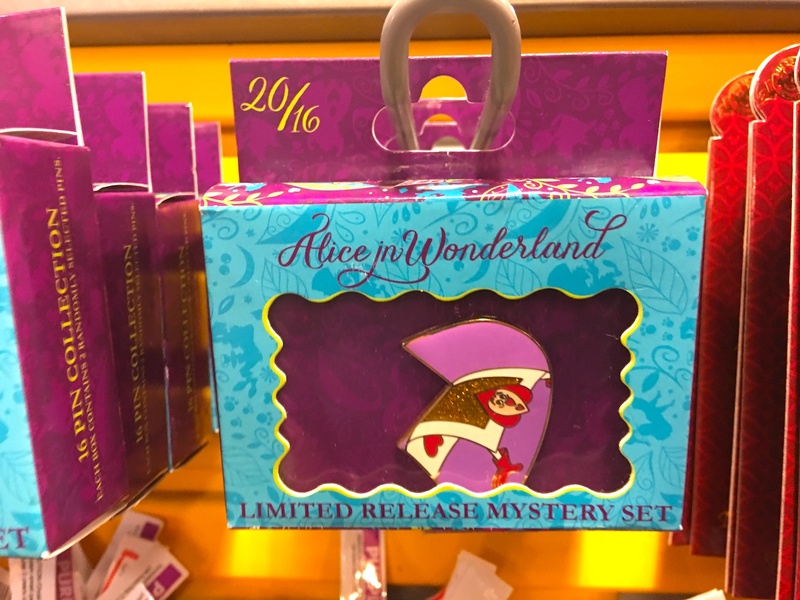 Let’s head over to the pin section, and we’ll start with this limited release mystery set featuring Alice in Wonderland. Originally $19.99, now $8.99. 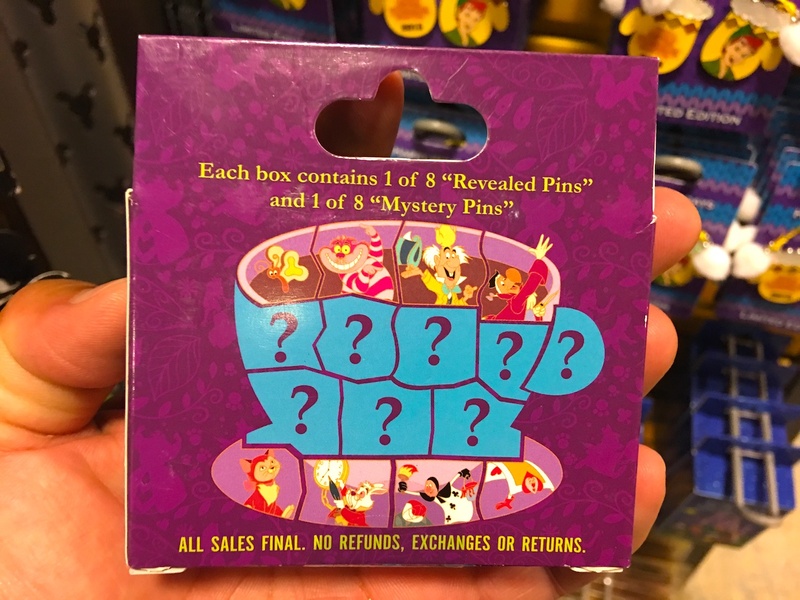 Here are the mystery pins. Speaking of Alice in Wonderland, love this mashup using the Red Queen and the Cheshire Cat in a scene out of the Haunted Mansion stretching room. Fantastic. Bought one of these. Reduced to $5.99. Couple Frozen pins. The rock troll was reduced to $2.99 while Olaf was $3.99. Liked this 1st Visit to WDW pin a lot. Reduced to $5.99. Okay, next up was a whole bunch of pins that guests could get during the EPCOT International Food & Wine Festival as part of Remy’s Ratatouille Hide and Squeak Scavenger Hunt. Each pin was $1.99. 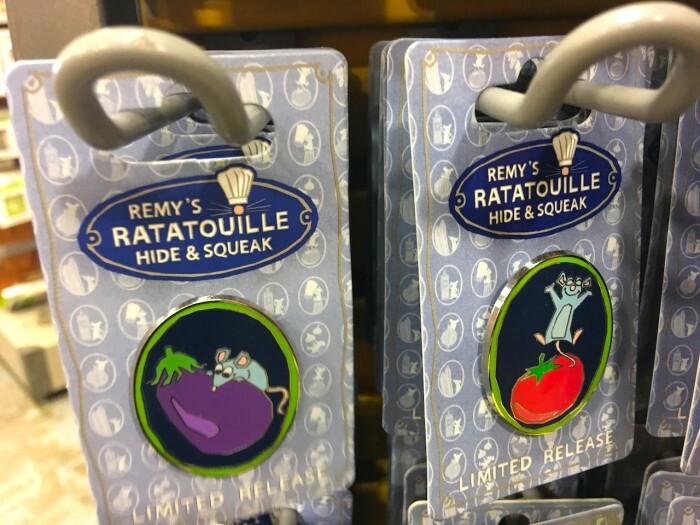 Ratatouille is definitely in my top five all time Pixar films. 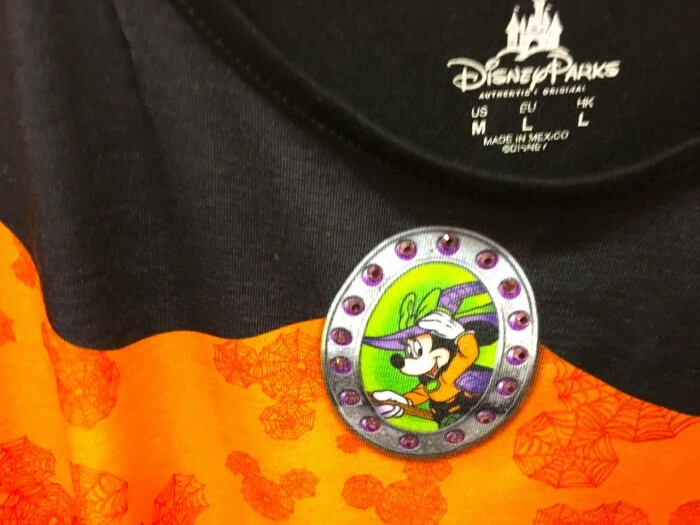 Some Halloween pins reduced to $3.99. 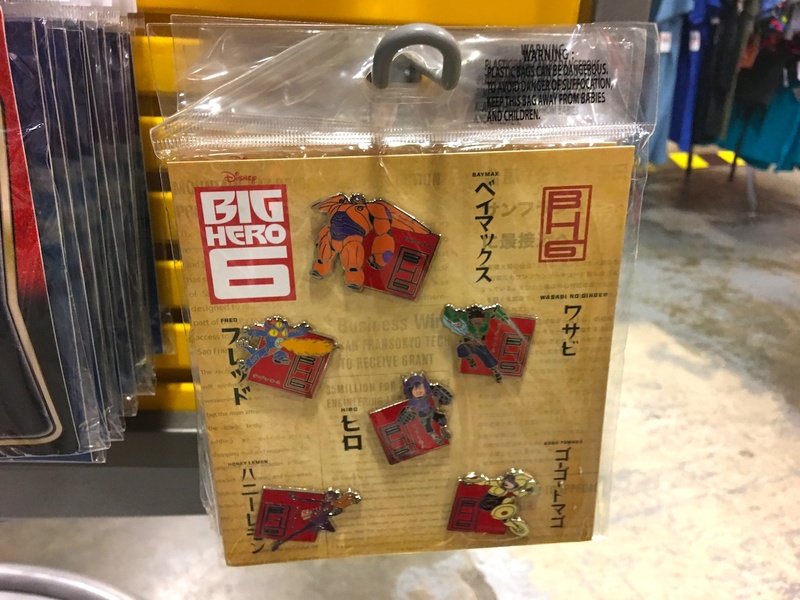 Big Hero 6 set of pins. 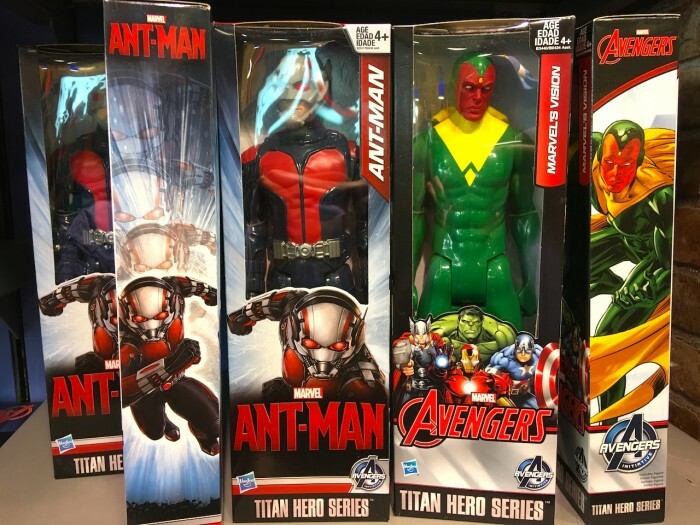 Originally $32.95, now $15.99. 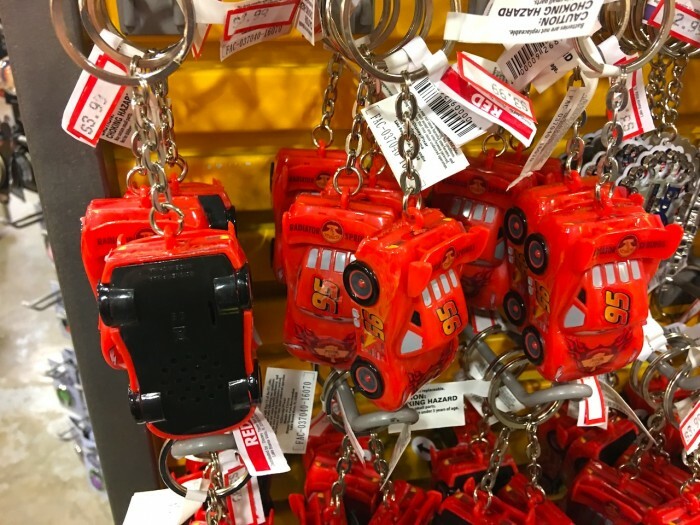 Lots of new keychains this month, including this one featuring Lightning McQueen. Reduced to $3.99. 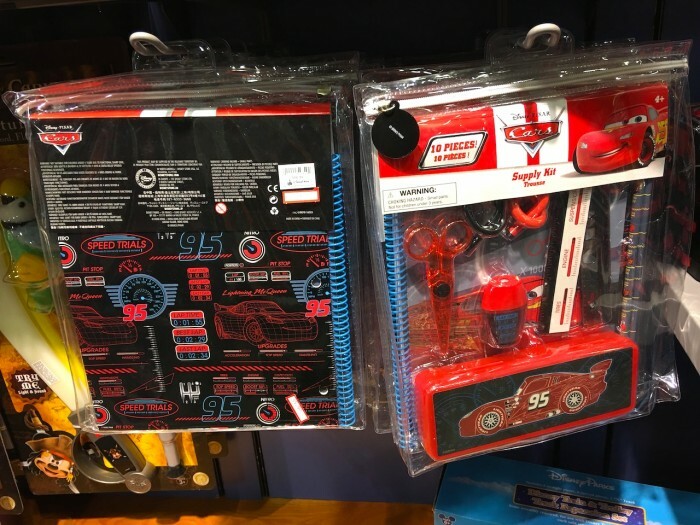 Speaking of Lighting, have you seen the new teaser trailer for Cars 3? 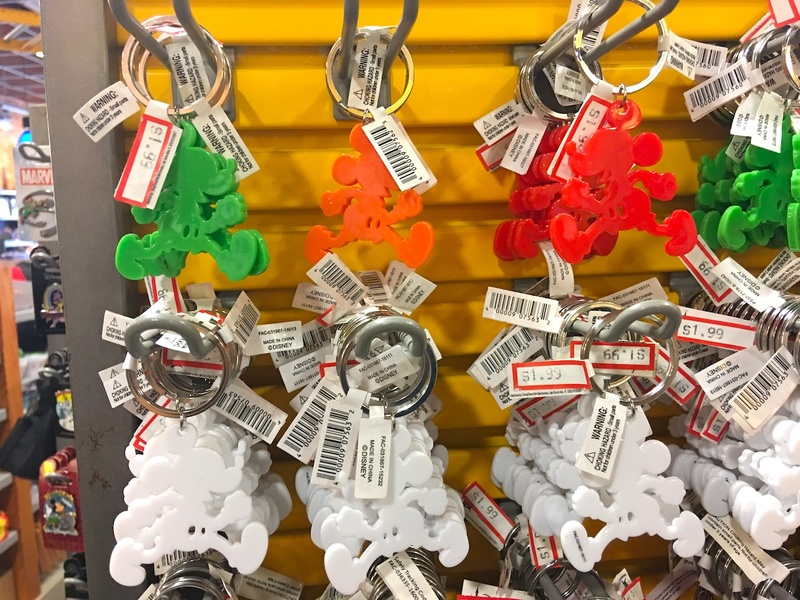 runDisney keychains. Reduced to $1.99. Here is the front and back of a princess set of keychains. This one features Cinderella. Originally $14.95, now $5.99. And here’s Ariel and Minnie Mouse. Same price. 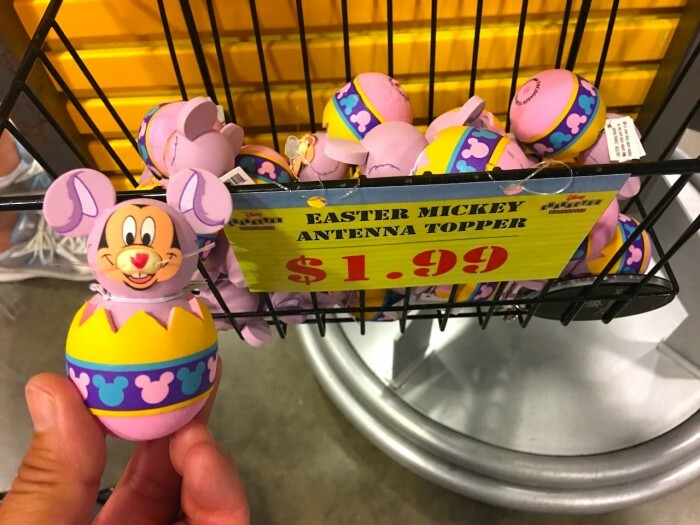 Easter Bunny Mickey Mouse antenna topper. Now $1.99. Have a feeling plenty of PT Cruisers have this baby on them. Some realistic Baloo and King Louie plush from the new Jungle Book movie. Have to say I enjoyed that movie much more than I thought I would and somehow Bill Murray’s role in Jungle Book was a million times more enjoyable than the one he had in the new Ghostbusters. 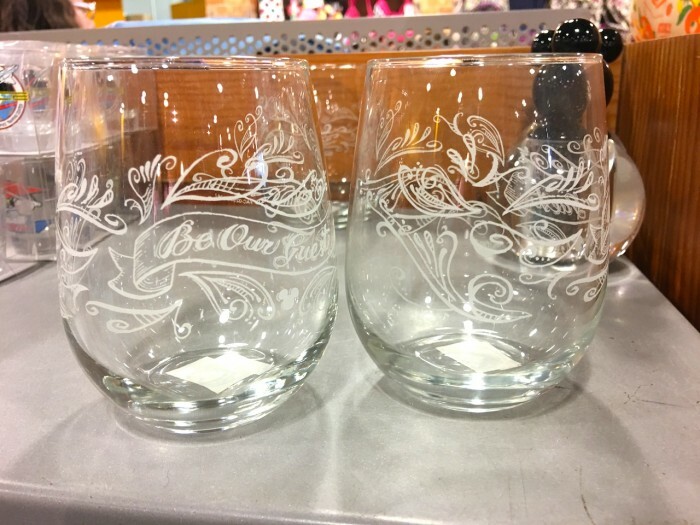 Each originally $19.95, now $9.99. 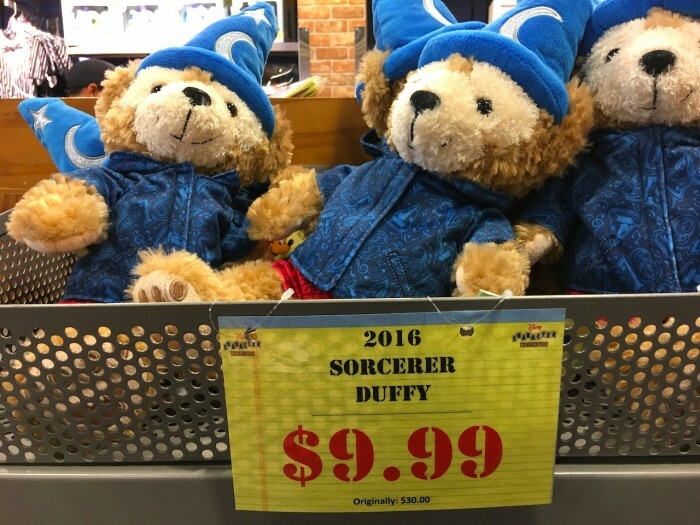 Sorcerer Duffy plush. 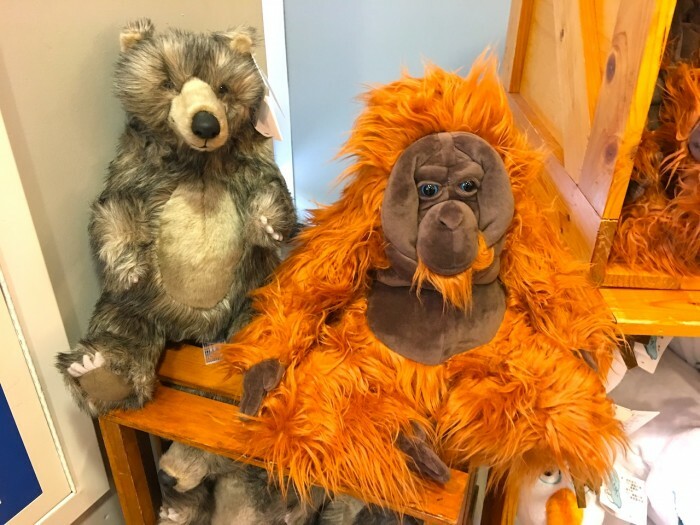 Would have picked this up as an early Christmas present for Duffy superfan Safari Mike, but I already got him something even better. This is kind of a weird one. 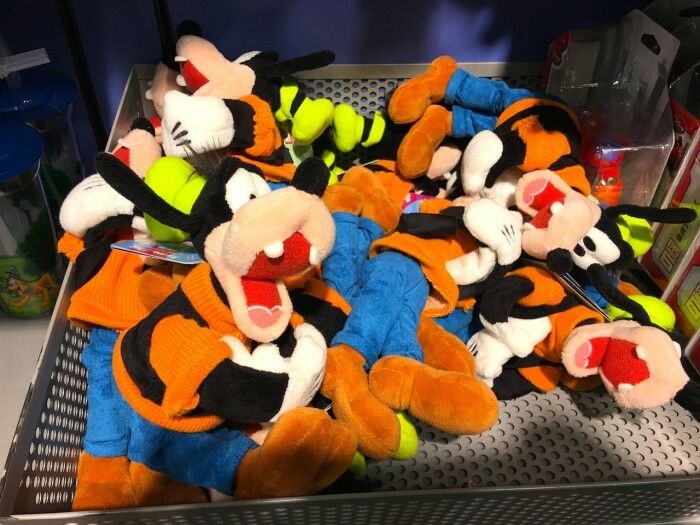 It’s a Goofy plush that you can wrap his hands around stuff. I have absolutely no idea what that could possibly be useful for. I tried to take pictures of this at my house but everything came out looking super phallic. 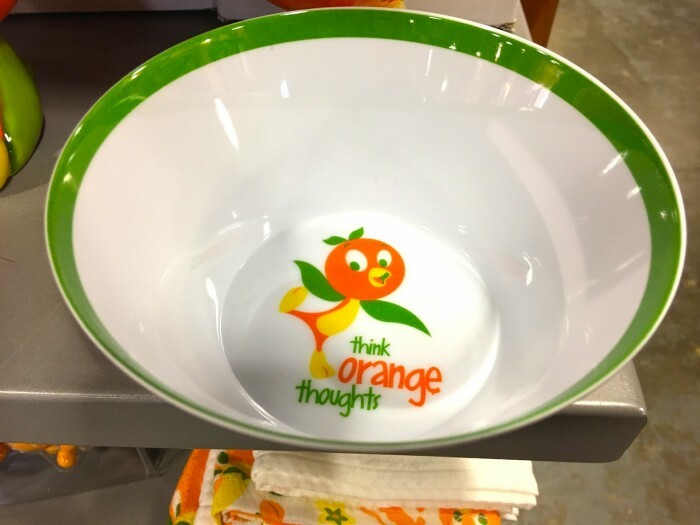 Originally $15.99, now $9.99. 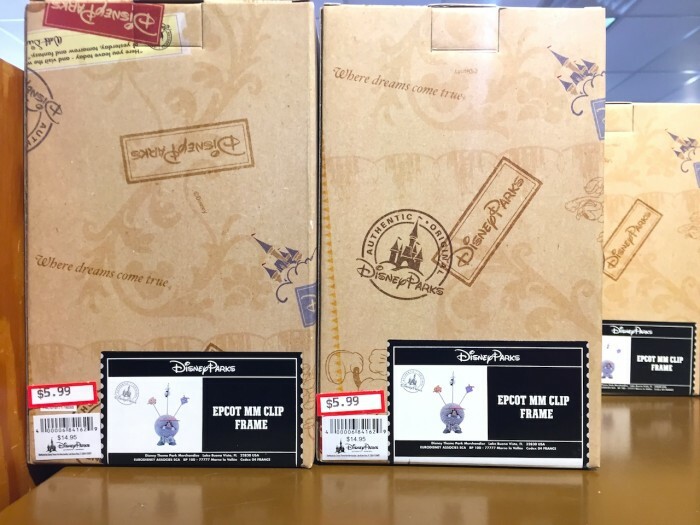 Actually will have my Goofy wrapping his arms around a bottle of wine for my fellow blogger Josh easyWDW as a Christmas present. Shhhhh! Don’t tell him. Let’s hit some clothes! First up is this Oswald the Lucky Rabbit jersey. Originally $29.99, now $9.99. 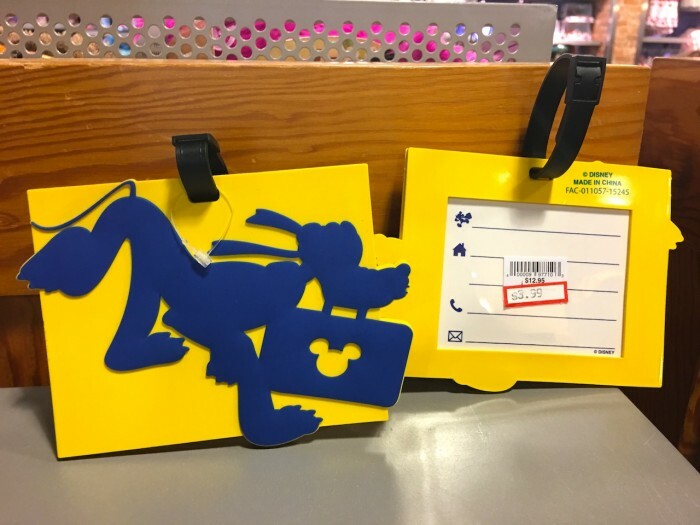 The 1927 refers to the last time Walt Disney World opened an E-Ticket attraction. 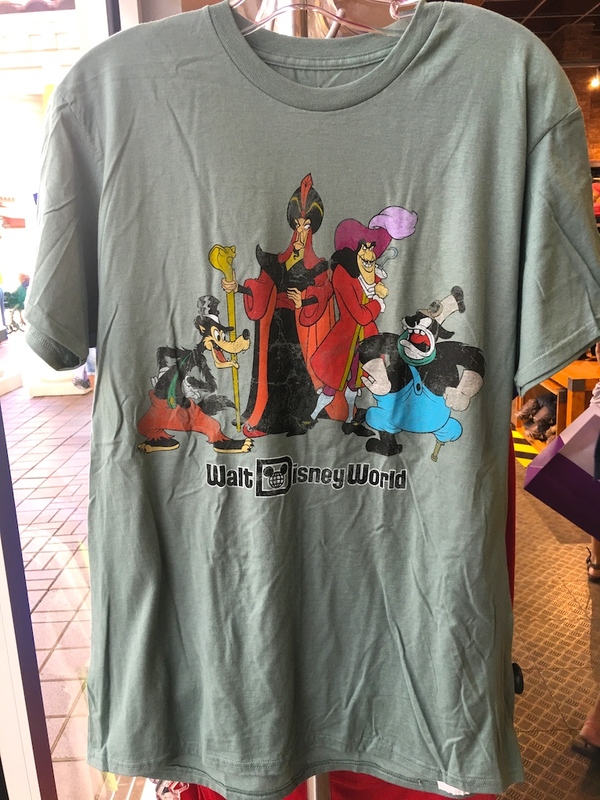 I liked this Disney villains shirt quite a bit. 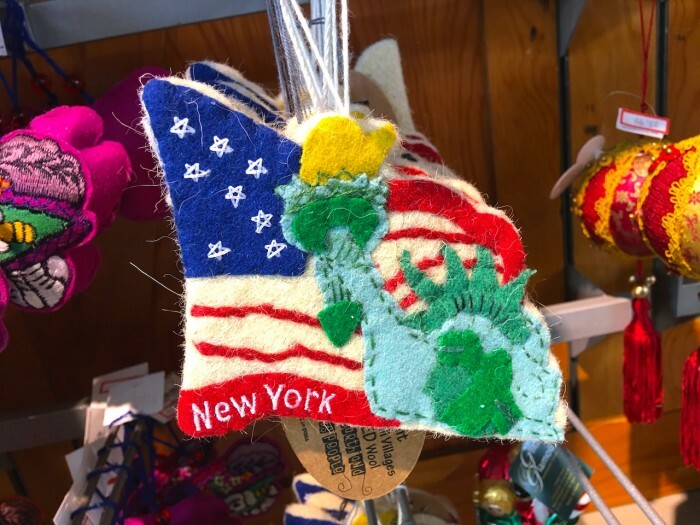 Originally $24.95, now $9.99. More Big Bad Wolf merch please. May have to get this shirt for my faithful leader, Laurel Stewart, as a Christmas present. As a vegan, Laurel is looked down upon by most of society, if not pitied, but she is the Endor that my forrest moon revolves around. Originally $24.99, now $9.99. 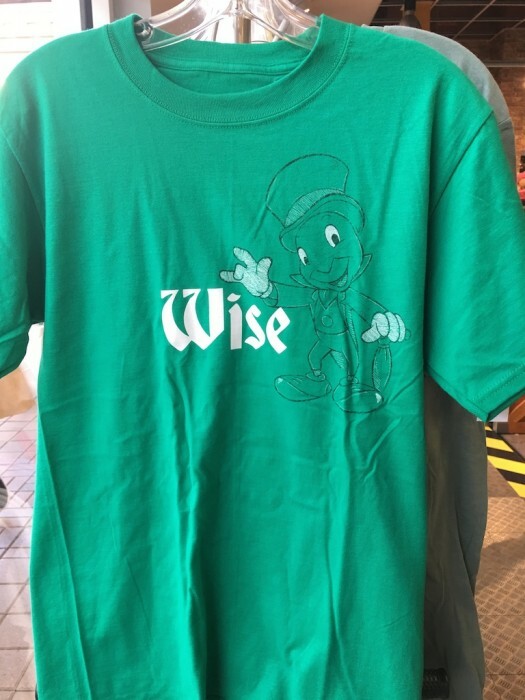 More Jiminy Cricket merch too please! 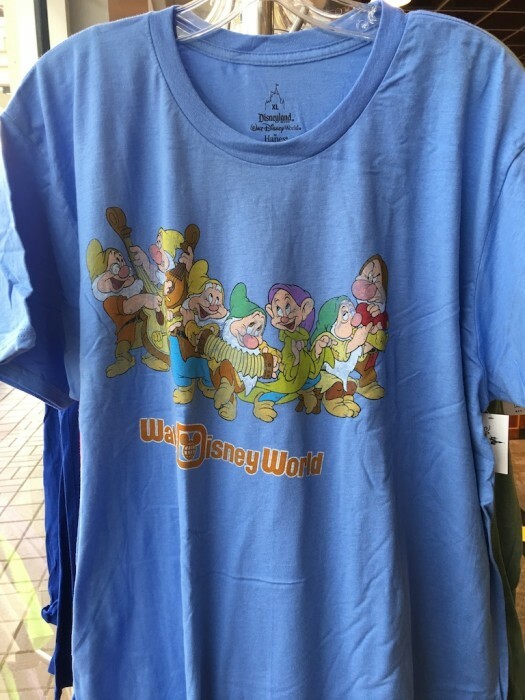 Nice Seven Dwarfs shirt. Originally $24.95, now $9.99. 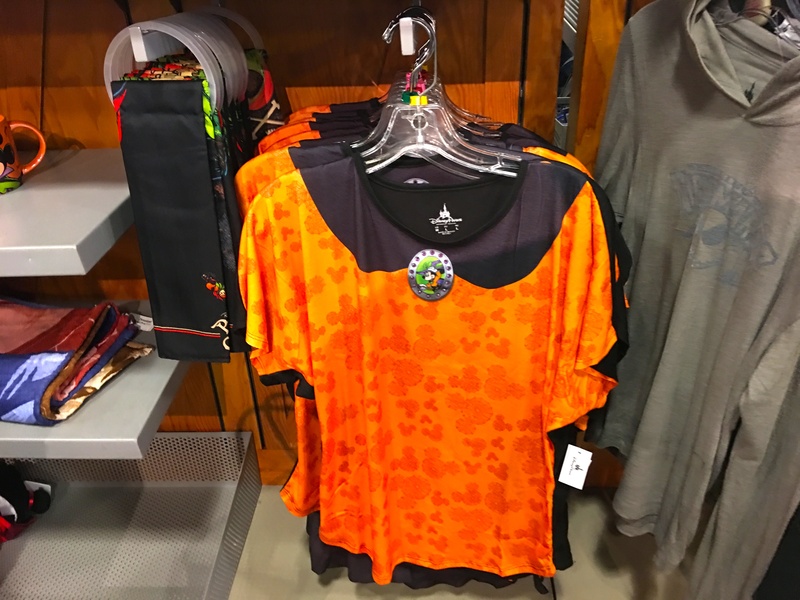 This Minnie Mouse halloween shirt was heavily discounted. Originally $29.99, now just $4.99. You have to love that a Medium here is a large everywhere else in the world. ‘MERICA! 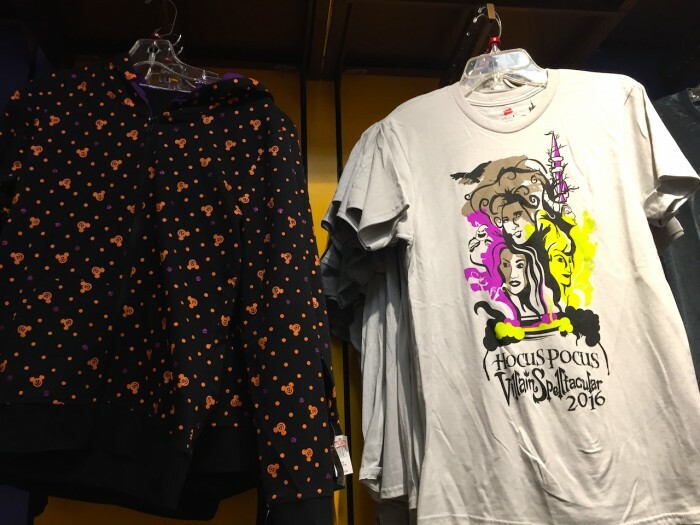 Couple more halloween garments including this ghastly Mickey head one on the left that was originally $54.99, reduced to $19.99. Also the Hocus Pocus shirt that was originally $27.99, now $6.99. I absolute LOVE Disney Springs, but not sure I really want a Disney Springs shirt. Originally $37.00, now $14.99. However the Main Street Electrical Parade is off the charts fantastic. Originally $29.99, now $7.99. Both of these shirts are from the 28 and Main brand of clothing. Basically these are very expensive shirts with awesome designs, but shirt quality of those shirts you get in knockoff gift shops on 192 that are 3 for $10. 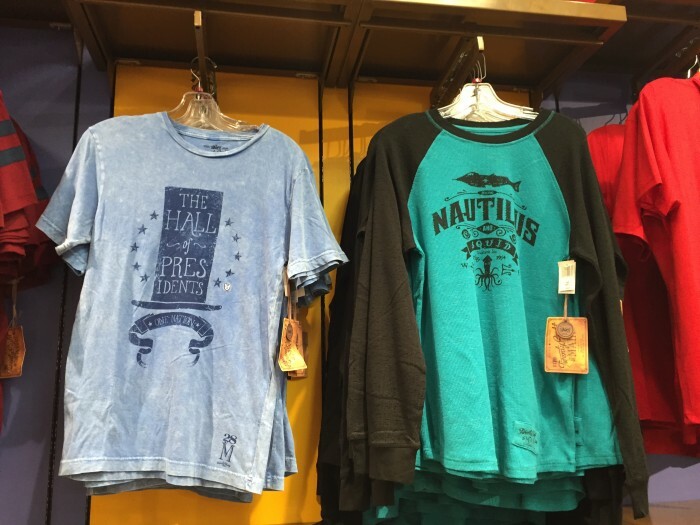 Really liked this Hall of Presidents and Nautilus ones. Originally $36.95, now $14.99. 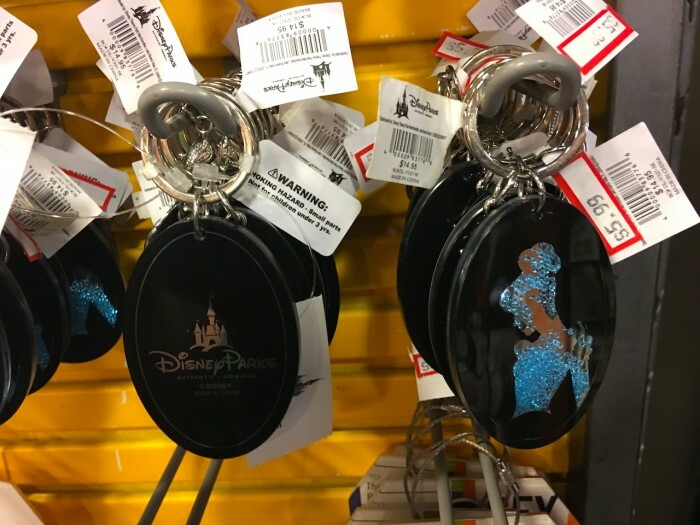 We may actually never seen another month where a pieces of Disneyland 60th merchandise hits the Outlets. 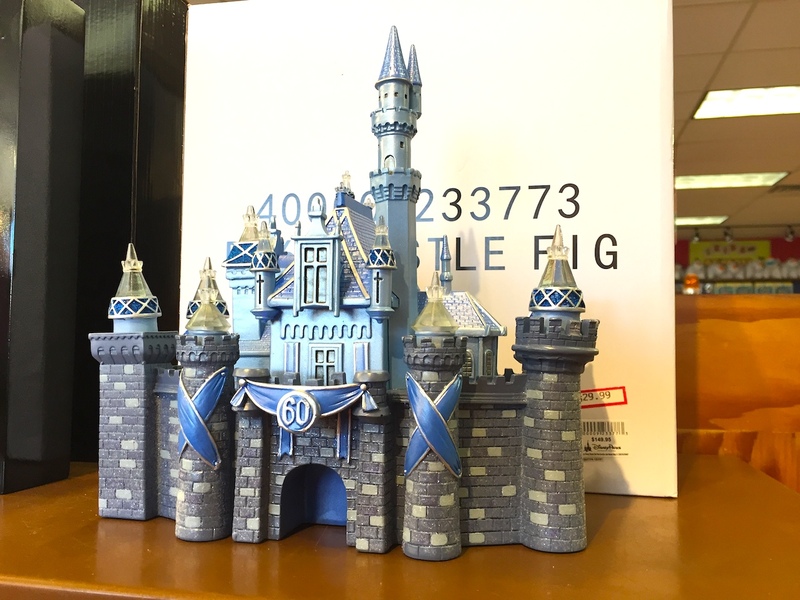 This castle replica was originally $149.95 and reduced to $29.99. I’m pretty sure this castle is at a 1:1 ratio to the actual one out in Anaheim. 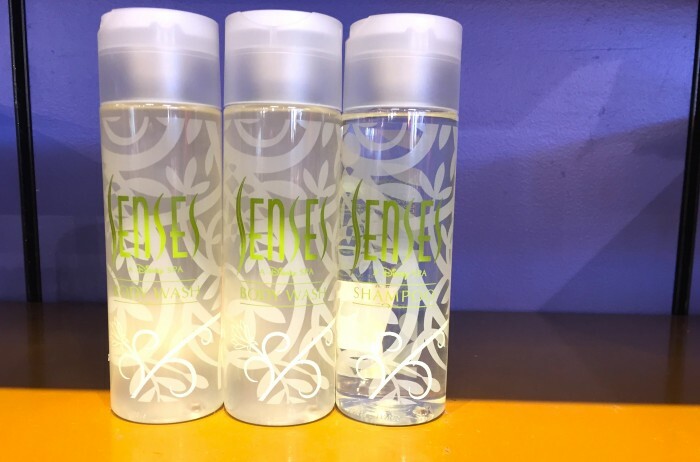 This is a first, an item from the Senses Spa at the Grand Floridian Resort. This bottle of shampoo was originally $7.99, now $1.99. Actually regretted not picking this one up. 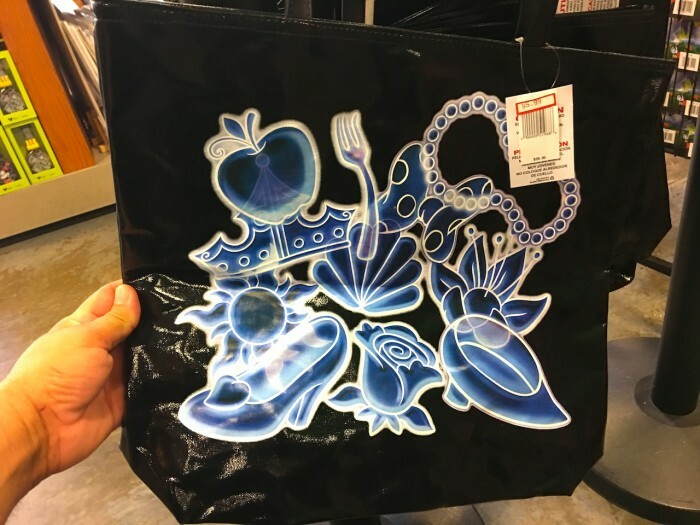 I’m guessing this is an EPCOT Flower & Garden Festival reusable bag. Originally $29.95, now $5.99. 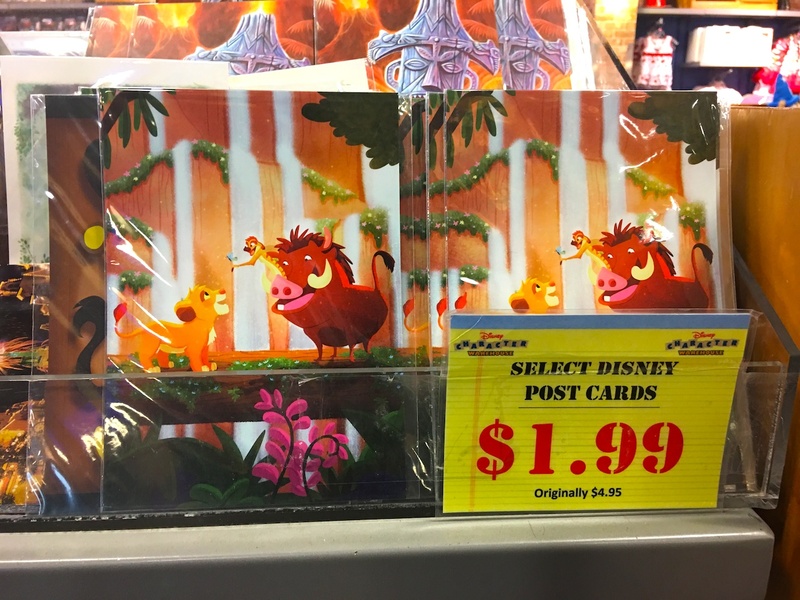 I loved this Lion King postcard and picked one up. 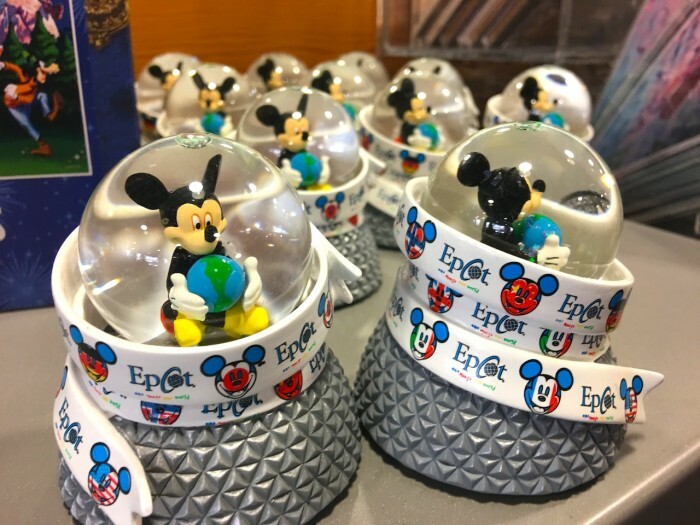 This was a EPCOT snowglobe that had Mickey sitting on top of Spaceship Earth and wrapped with a World Showcase ribbon. Originally $16.95, now $7.99. 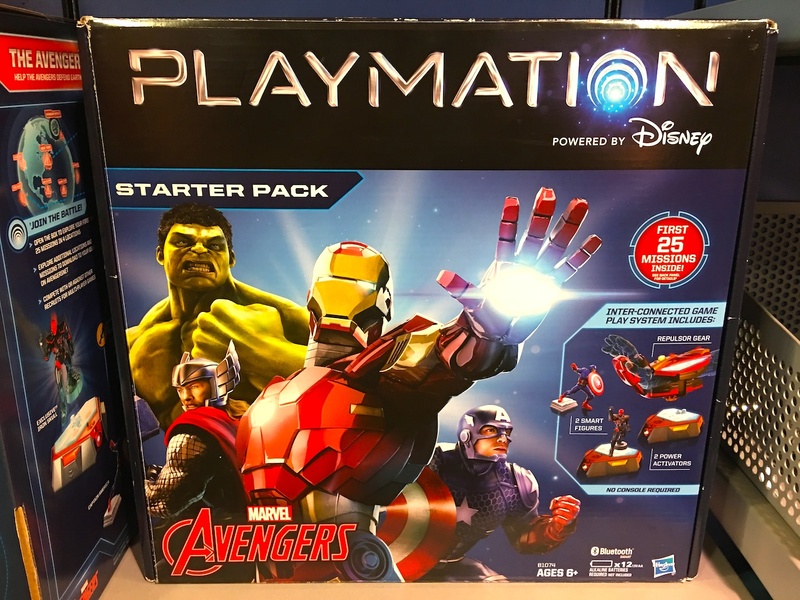 Ahhh, this was the original Iron Man blaster that started off the first commercials for the Playmation line of toys. 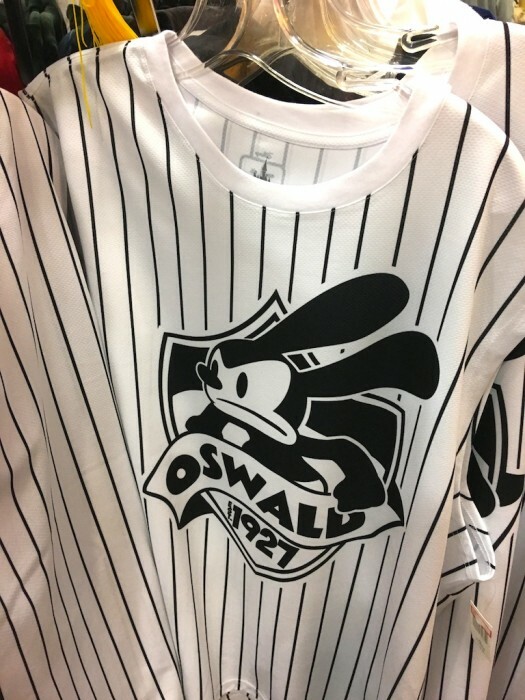 Originally $49.95, now $34.99. 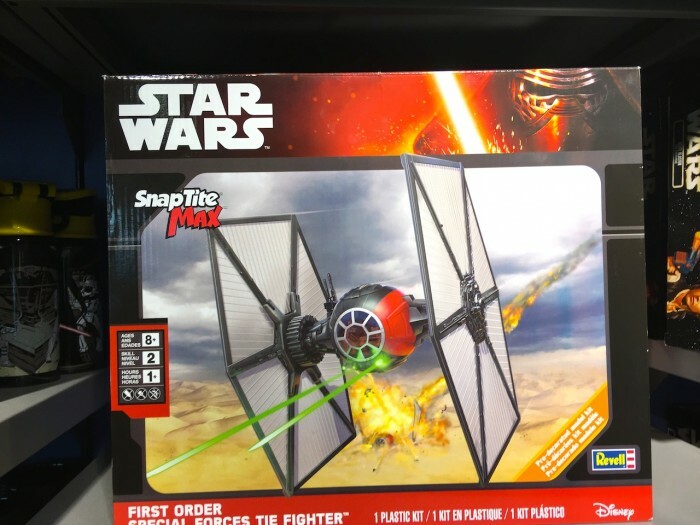 With the upcoming Star Wars Land in DHS, I would put the smart money on something like this being implemented as a way for guests to use “the force” around the land similar to how Muggles can use interactive wands in the Wizarding World of Harry Potter. A couple of the Avengers B-team arrived with Ant-Man and the Vision. Both were reduced to $11.99 which is about $2 more than you’ll find them at full retail at any non-WDW store. Neat Cars branded “supply kit” for school kids. Something I would have loved at 10 years old. Originally $16.99, now $5.99. 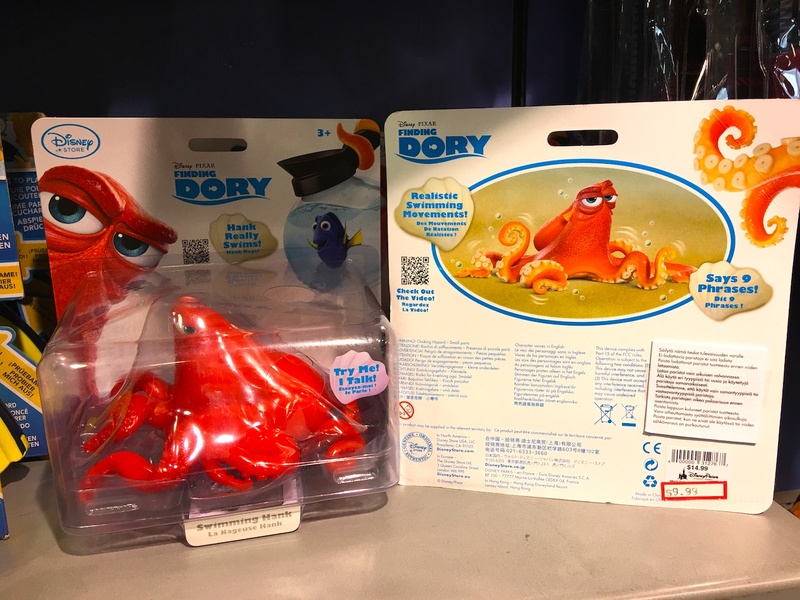 Finding Dory toy in which you record your voice to “speak whale.” Interesting idea. Originally $14.99, now $9.99. Hank toy that says 9 phrases. Originally $14.99, now $9.99. 9 phrases is about 3 more than my co-host Chris Wakefield has ever said in an episode of the E-Ticket Report podcast. 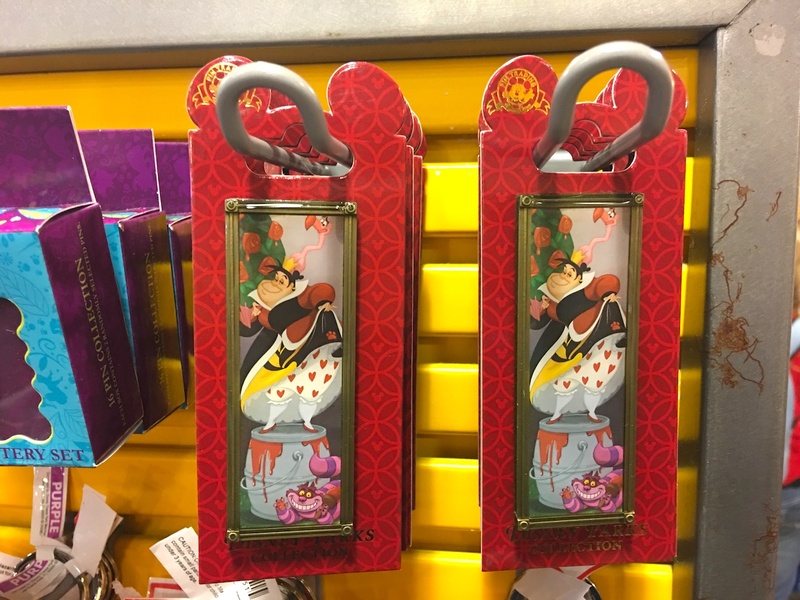 Last but not least is this EPCOT MM Clip Frame. 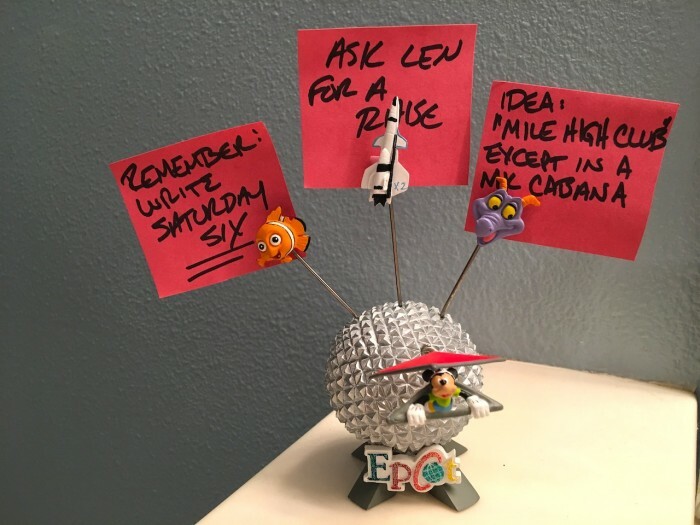 It features Spaceship Earth and off it are clips featuring Nemo, a rocket for Mission: SPACE, and Figment. 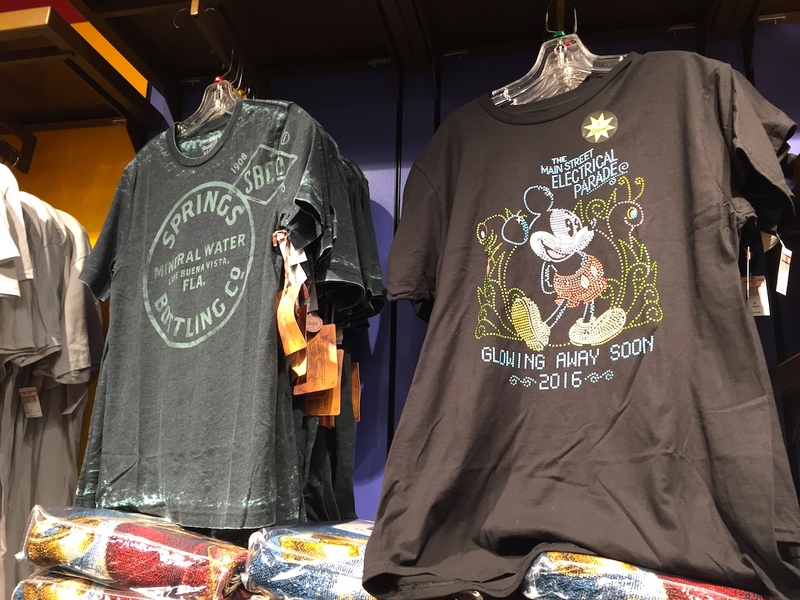 a Mickey Mouse on a hang glider from Soarin’ is on a spring in the front. You use it to hold notes or pictures. 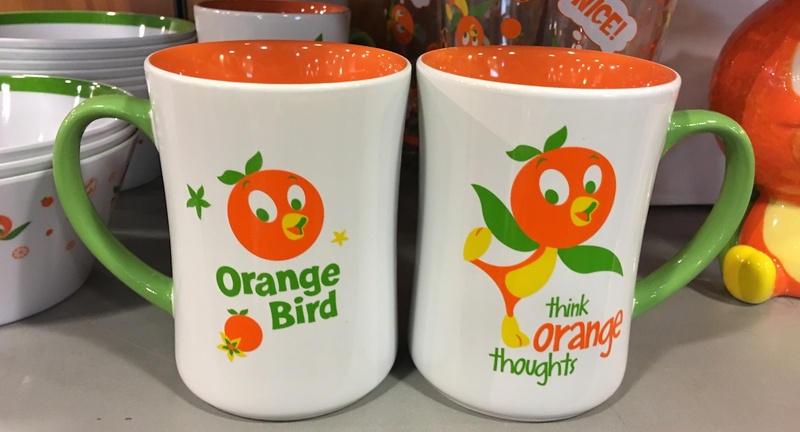 Originally $14.95, now $5.99. I picked this up and has found it really helped me stay organized. 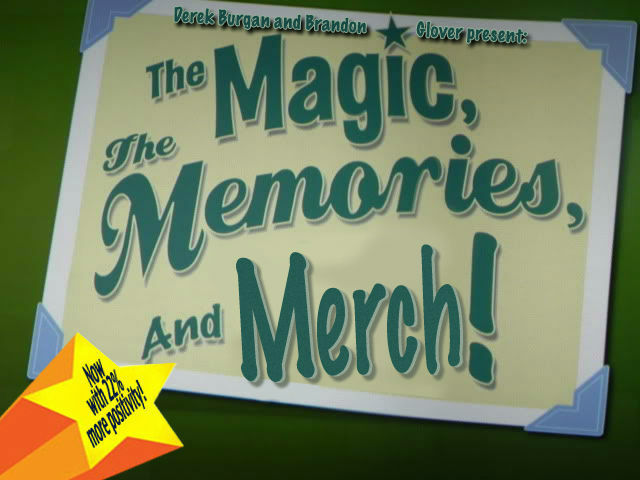 Previous editions of Magic, Memories, and Merch: July 2013, August 2013, September 2013, October 2013, November 2013, December 2013, January 2014, February 2014, March 2014, April 2014, May 2014, June 2014, July 2014, August 2014, September 2014, October 2014, November 2014, December 2015, January 2015, February 2015, March 2015, April 2015, May 2015. June 2015, July 2015, August 2015, September 2015, October 2015, November 2015. December 2015, January 2016, February 2016, March 2016, April 2016, May 2016, June 2016, July 2016, August 2016, September 2016, and October 2016. Looks like the “travel flat” is a slip on shoe for once you’re in transit and want to be comfy? Now THIS I gotta see! 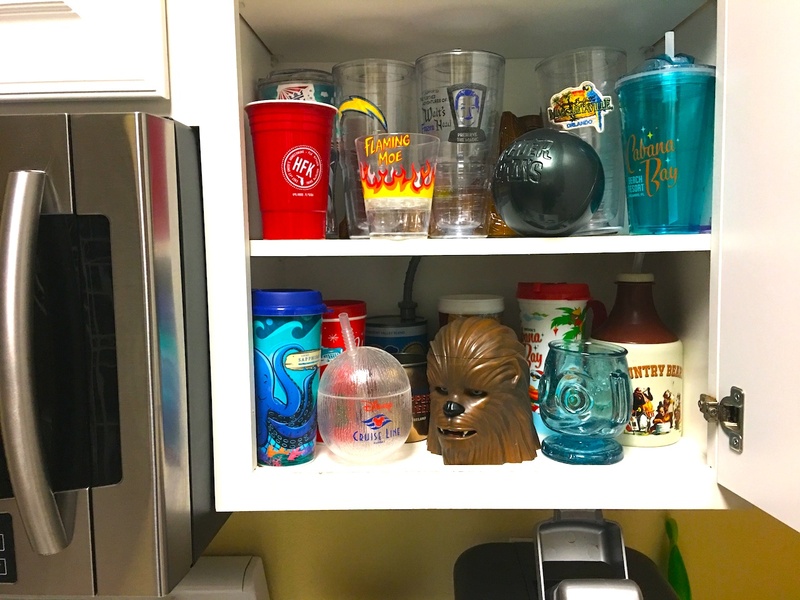 I spy a Chargers Tervis in that cabinet. I own the powder blue version. Until the leave San Diego, then I burn it! Always cool spotting Chargers stuff in the least likely locations. Agree 100% Jason. Chargers fan until I die, or they move to Los Angeles, whichever comes first. I am never going near one of those MK cabanas now. I’ve listened to enough “E-ticket report” episodes to actually hear Derek’s voice scream “OF COURSE I BOUGHT IT!” about the Chewie mug. Ever thought of recording yourself reading the outlet report and releasing it as a podcast? That will be exclusive to my Gold Level Patreons. The Oliver Twist part is classic!!! 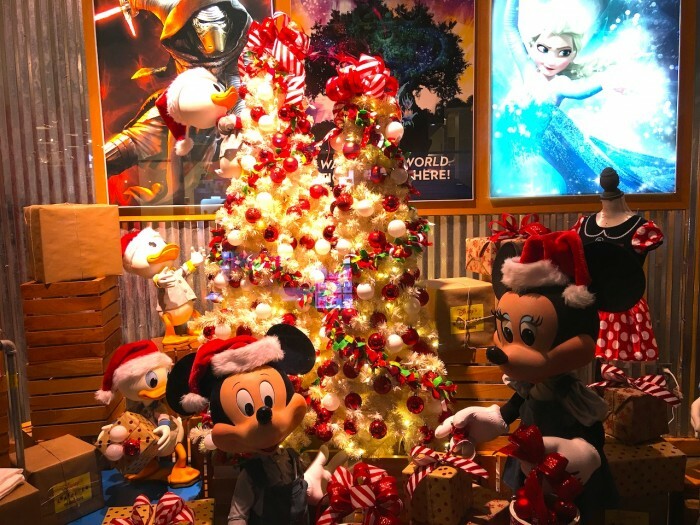 :) I wonder if they will be doing this at the Jingle Bell Jingle Bam dessert party. That might be a cool one, but it’s not a party that many people will repeat. So maybe no extras there. Dear Derek, You are my favorite. Also, I’m jealous of your fancy Walt’s Frozen Head cup. I contributed to the Kickstarter, but I ain’t got no stinkin’ cup. 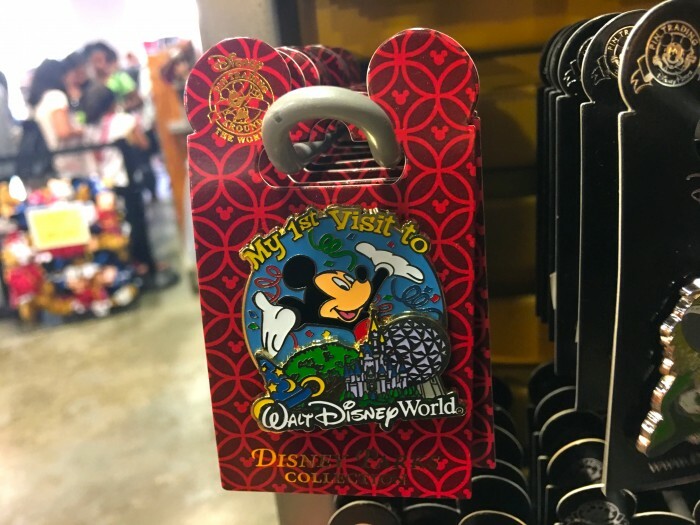 At this point, Vineland is bigger (and in my view is easier to park at because it has a parking garage that is convenient to getting to the Disney outlet store). Both locations tend to have the same types of things, but it is hit and miss which gets better stuff when there are limited quantities. I prefer Vineland, though. 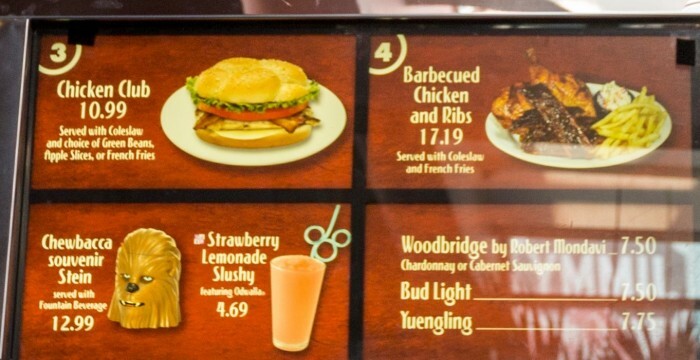 I always preferred the Vineland location. Traffic getting to and from the outlet can be a mess, especially around holidays. Always park in the garage. Always. Don’t even try to park in the lots. 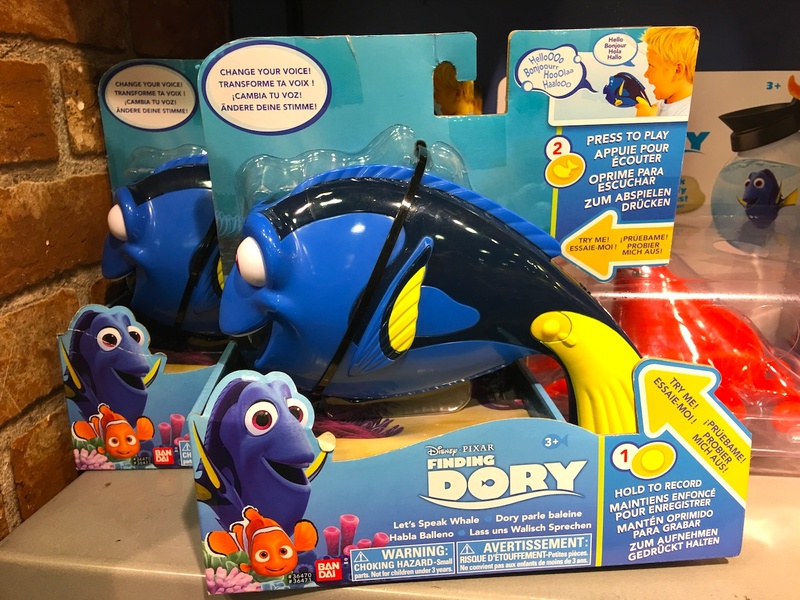 We definitely have the Dory coffee mug and it is my husband’s very favorite mug. He drinks out of it every weekend. 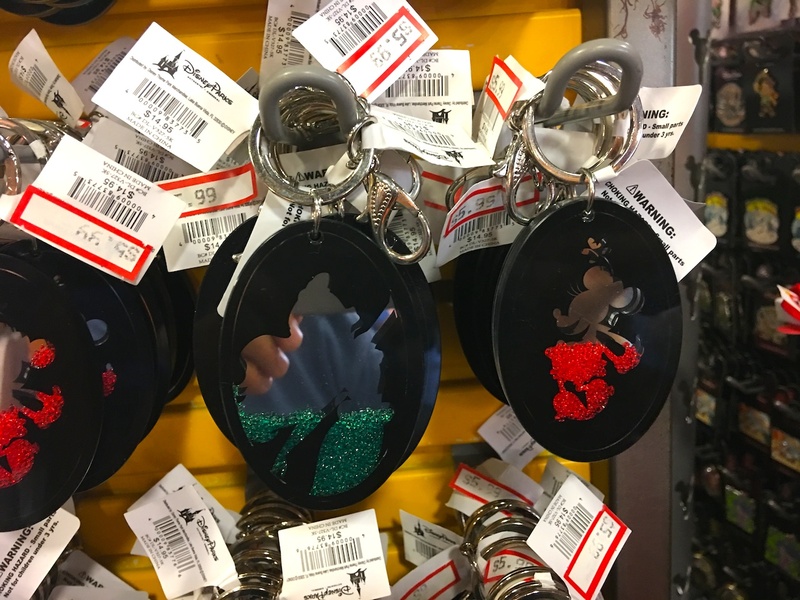 We’re still seeing Disneyland 60 things show up at the mini outlet we have here in Grapevine, TX. So much Disneyland 60. My wife bought the Minnie Mouse Halloween shirt when we were there in Oct, it perfectly matched the DIY Minnie Ears she made for the party.